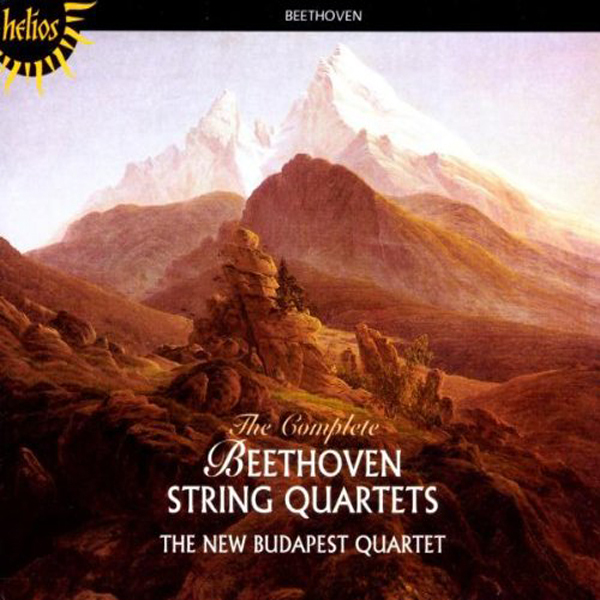 Continuing my discographies, this is a survey of - hopefully - every extant recorded cycle of Beethoven's String Quartets. As of September 2017, it includes 63 different cycles (one incomplete, one that may not be finished, and another soon to be finished) spanning 70 decades of recording history. I am sitting on the data for several new discographic entries under work. 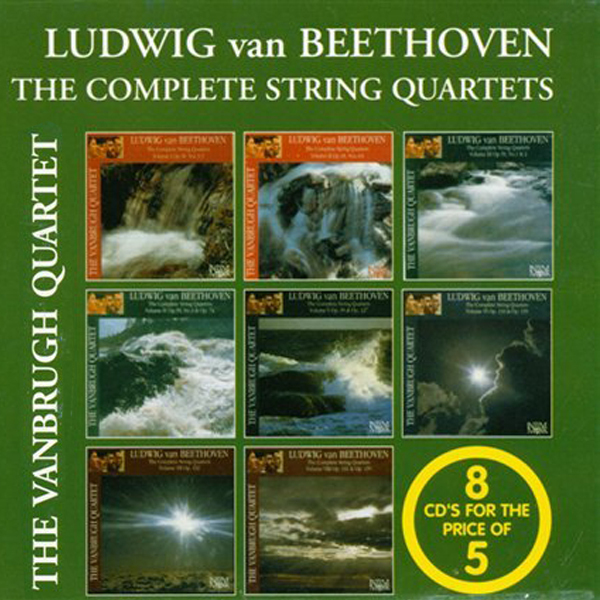 Ring cycles, Mahler, Nielsen, Martinů and Beethoven symphony-cycles, as well as Bartók and Shostakovich string quartet-cycles. They just take an awful lot of time to research and then put into html-presentable shape and even then they are rarely complete or mistake free. 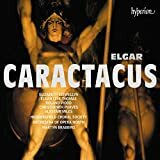 Neither will this one be, and every such post is also a plea to generously inclined readers with more information and knowledge of the subject than I have to lend a helping hand correcting my mistakes or filling data-lacunae. I am explicitly grateful for any such pointers, hinters, and corrections and apologize for any bloomers. 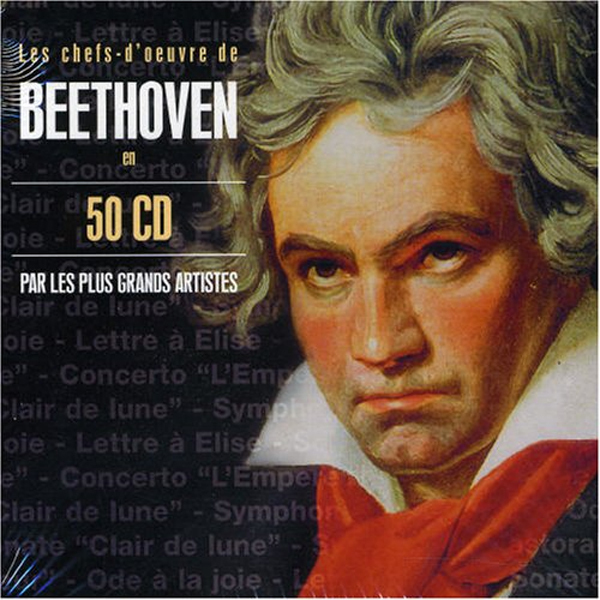 Unlike some earlier discographies, this one does intend to be comprehensive. So I am especially grateful if I have sets that I have missed are pointed out to me. I have not listened to them all, of course, but about 20. Favorites are indicated with the "ionarts choice" graphic. With nearly 2000 links in this document, there are, despite my best efforts, bound to be some that are broken or misplaced; I am glad about every correction that comes my way. 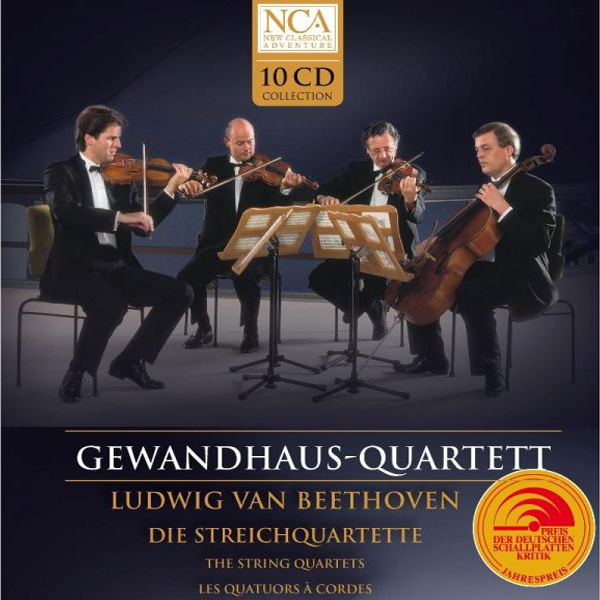 Edit 03/03/19: Deutsche Grammophon has luxuriously re-issued the Amadeus Quartet's classic cycle on CD/Blu-ray. Comments below. 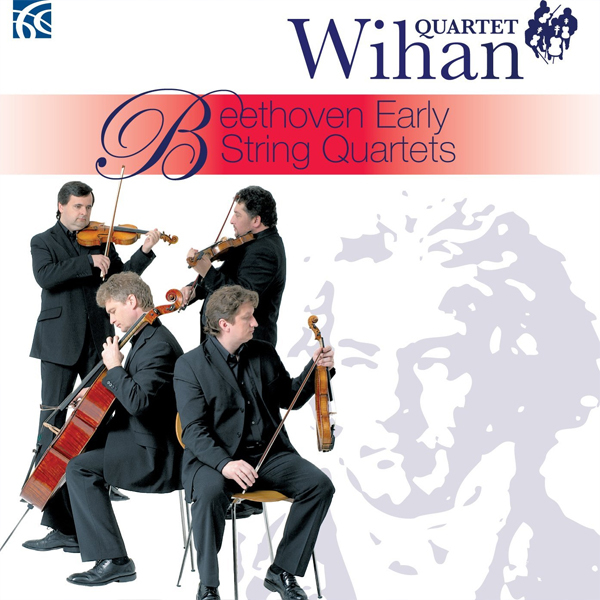 Edit 28/05/18: Thanks to Barry Lyons for pointing out that the Wihan Quartet (Wihanovo kvarteto) has in fact recorded a first cycle. Solidly oop but added below. 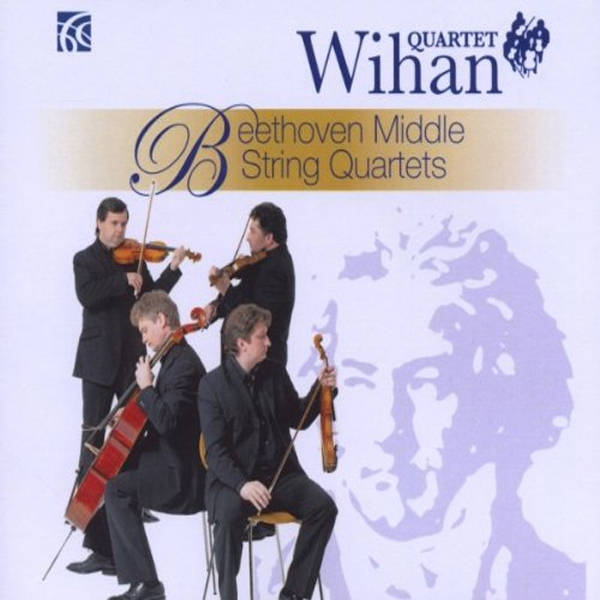 Edit 20/01/18: The Wihan Quartet cycle on Nimbus Alliance, hitherto overlooked (thanks to Mark Wilson who alerted me to that fact in the comments! 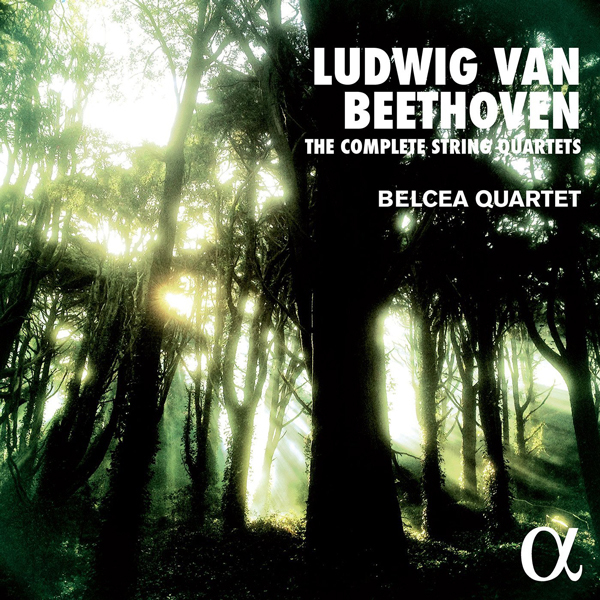 ), has been added. It brings this list to 66 (68, if you count the kind-of-cycles of the Peterson and Hagen Quartets) to cycles. 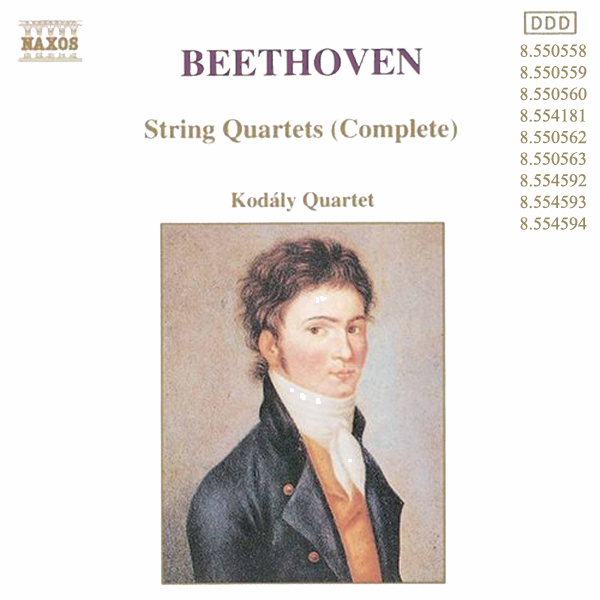 Edit/News 10/07/17: Melodiya has, after being contacted by ionarts, found the tapes for the Beethoven String Quartet's Beethoven String Quartet cycle (try searching for that one on Amazon or Google!) in their archives and is considering giving it a first-ever digital release. More news here if and as they develop. Edit 09/29/17: Many thanks to "Bill@deepkimchee" who alerted me to the Cleveland Quartet's firs cycle on RCA, which has now been added. 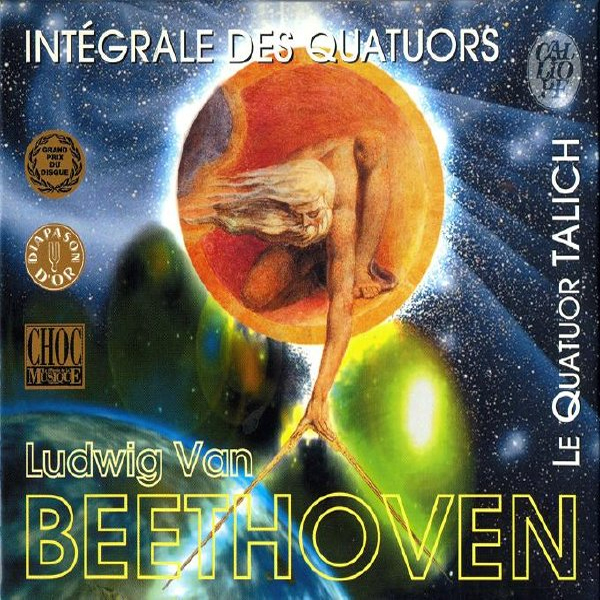 I am also trying to find more information on other alleged cycles, including a stereo cycle of the Russian Beethoven Quartet (app. 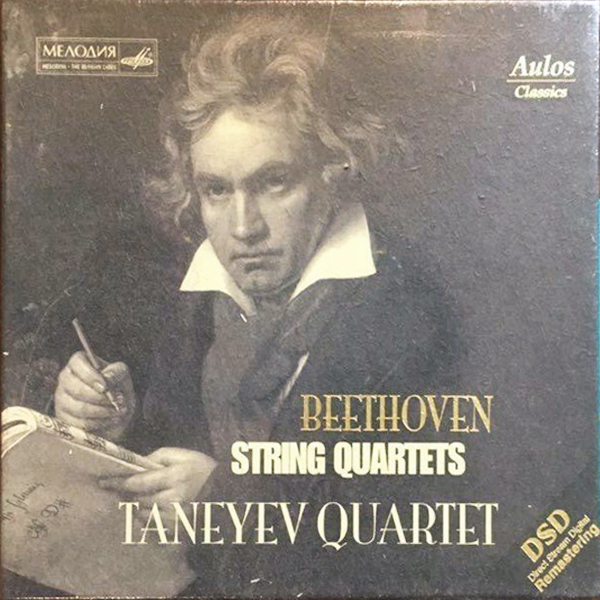 recorded between 1969 and 1972 for Melodiya). 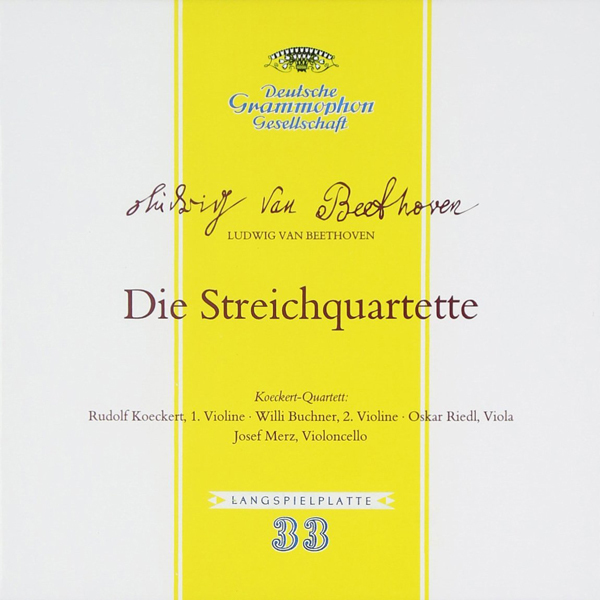 The cycle by the German Schäffer Quartett (Le Club Francais du Disque/Muridire; early stereo), re-issued by ForgottenRecords, will be added shortly. Edit 09/20/17: I am adding links to MusicWeb-Intl. 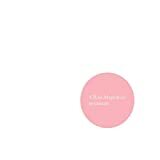 reviews of complete cycles for further reading, wherever they have a well-written review up. 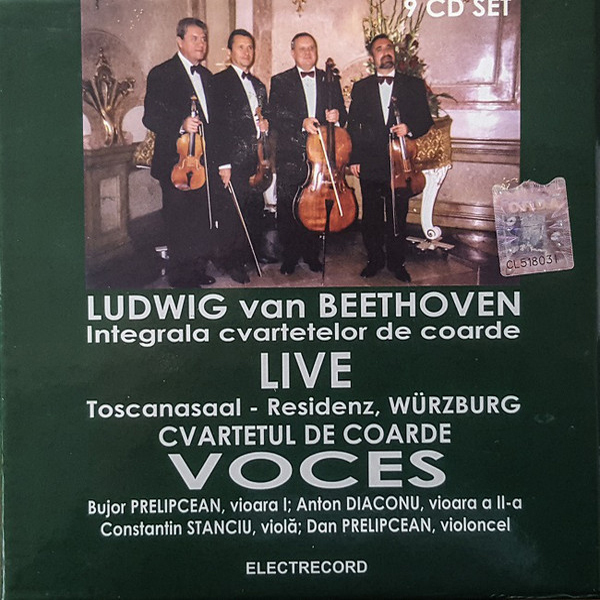 Edit 09/18/17: Already the first corrections come in: It's been pointed out to me that I have missed the Romanian "Cvartetul de Coarde Voces" and their 1998 cycle on Electrecord. Will be added tomorrow. 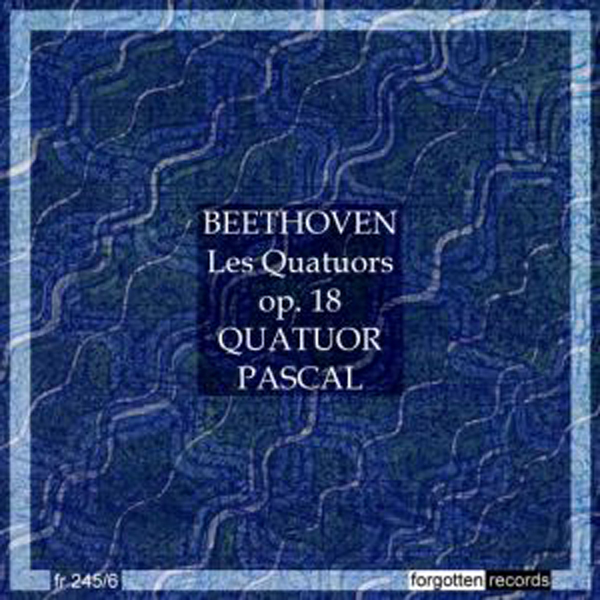 And the Brilliant re-issue of the Guarneri cycle is not the RCA cycle, but the Philips/Decca one, after all. 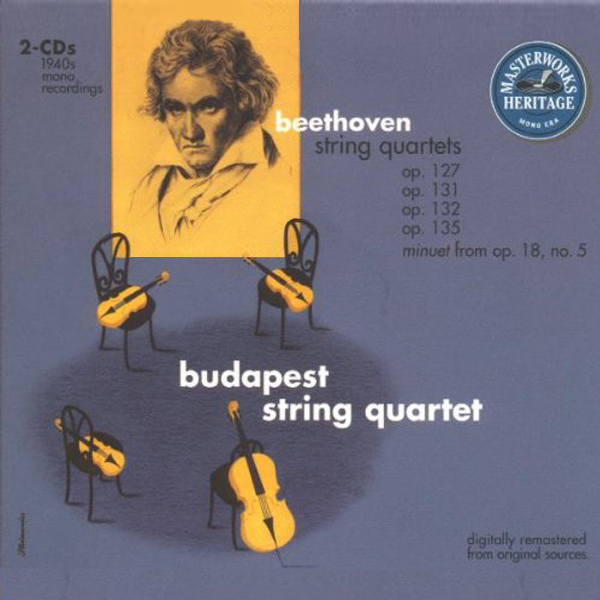 This is technically the first cycle of the Budapest Quartet. 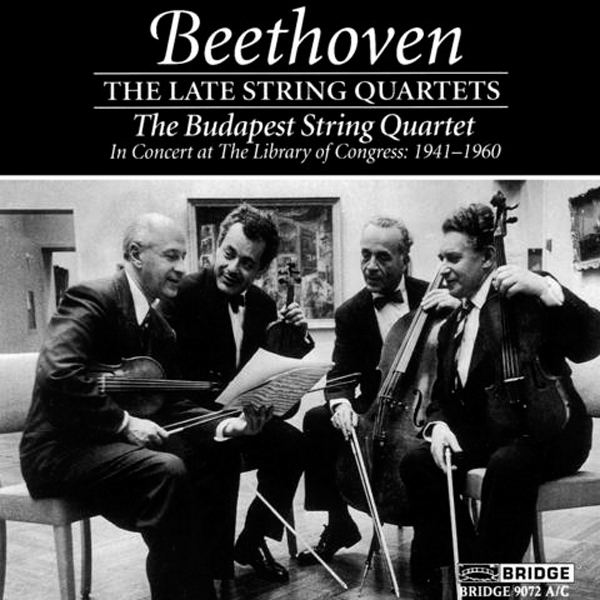 It contains recordings with the last remaining Hungarian member, István Ipolyi. 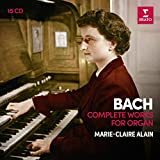 It is missing two movements from op.18/5 to be truly complete and was only partially re-issued on Columbia Masterwork Heritage. Mono. This is the first of the two famous Budapest String Quartet Cycle. Mono. I am not aware of another issue than that of United Archives, which is excellent in every way, including the remastered sound. Edit 5.20.18: Sony's claim is to have "reissued [this 1951-52 cycle] as a complete set - for the first time in its entirety on CD, and newly remastered from the original tapes" with their 2018 re-release, replicating the original LP sequencing, cover art and labels. 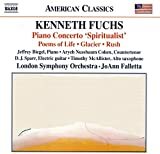 Jed Distler reviews the set on ClassicsToday here. 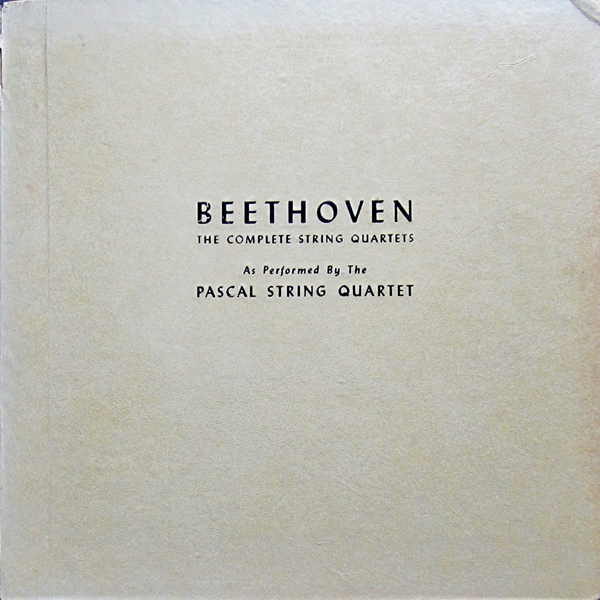 The Pascal Quartet's cycle was initially issued on 13 Nixa LPs and also included the arrangement for string quartet of the op.2/3 piano sonata. 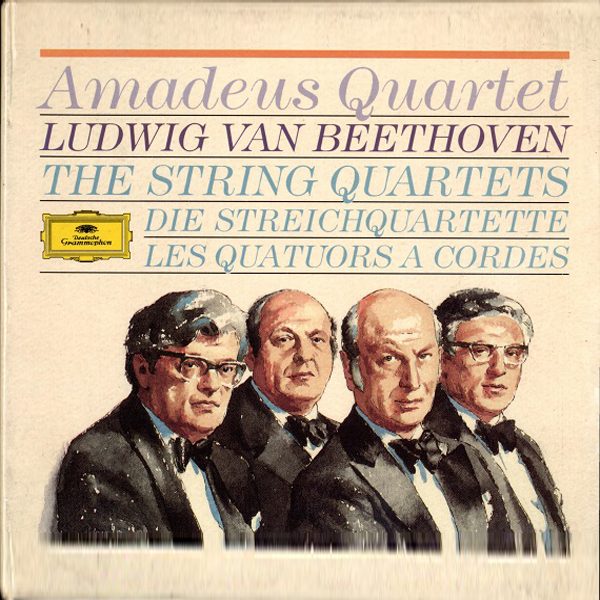 It also made an appearance on Concert Hall Society LPs. 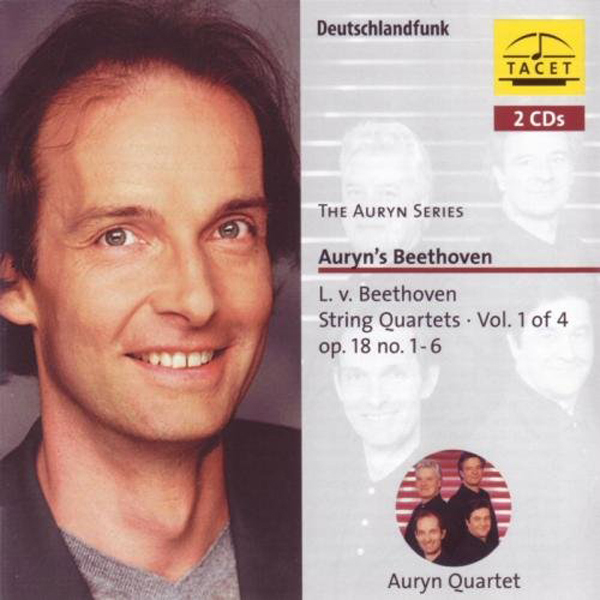 MusicWeb review by Jonathan Woolf. 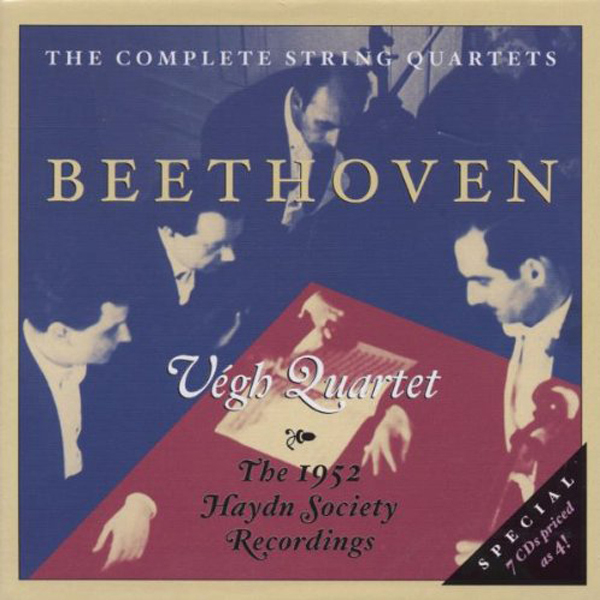 The wonderful Quatuor Végh recorded this, their first, set in 1952 for the Haydn Society. Mono. 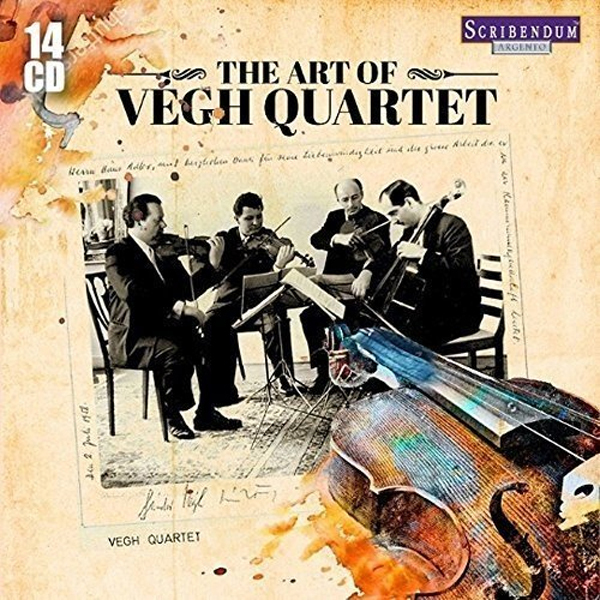 "The Art of the Vegh Q4t"
Unlike the Budapest Quartet, the Hungarians were actually mostly Hungarians - founded by Sándor Végh (who was no longer a member by these recordings were made, as he left in 1940 to found the Végh Quartet; his replacement, Moszkowsky, was Russian). 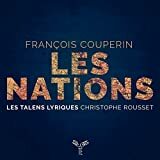 This is their first, probably more famous cycle, recorded in Paris. Mono. 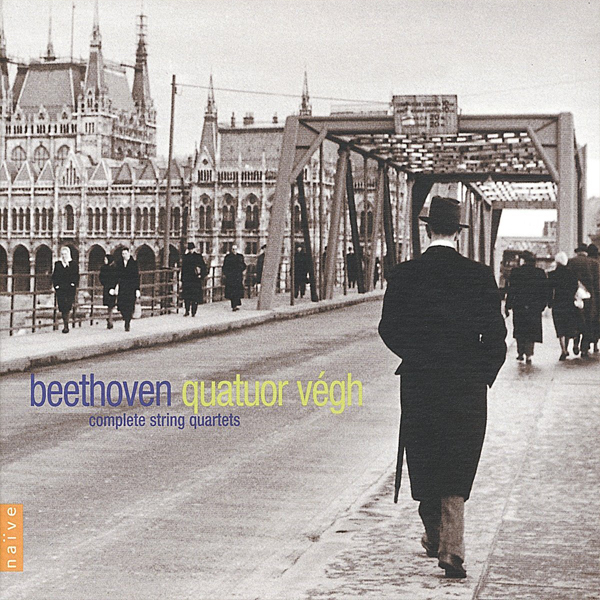 This is the cycle that the Viennese Barylli Quartet (founded by Walter Barylli, concertmaster of the Vienna Philharmonic) recorded for Westminster. Mono. Their cycle has been brought out on CD by Tower Japan. It is also included in this much less attractive catch-all box from Scribendum. 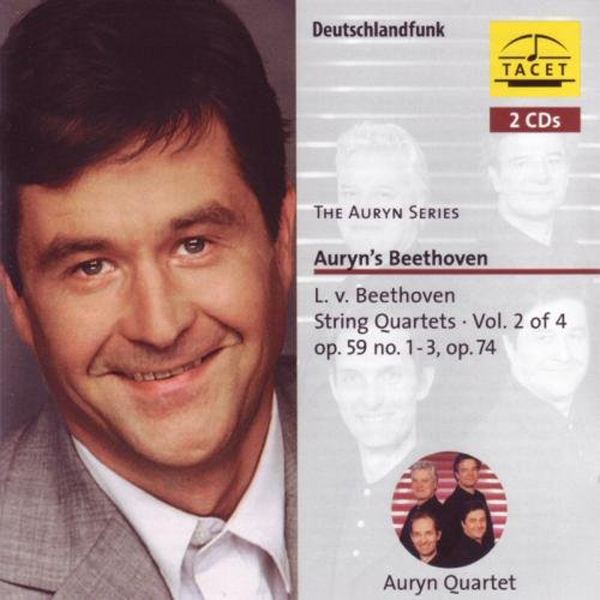 This cycle was one of Claudio Arrau's choices on BBC 4's Desert Island Discs. 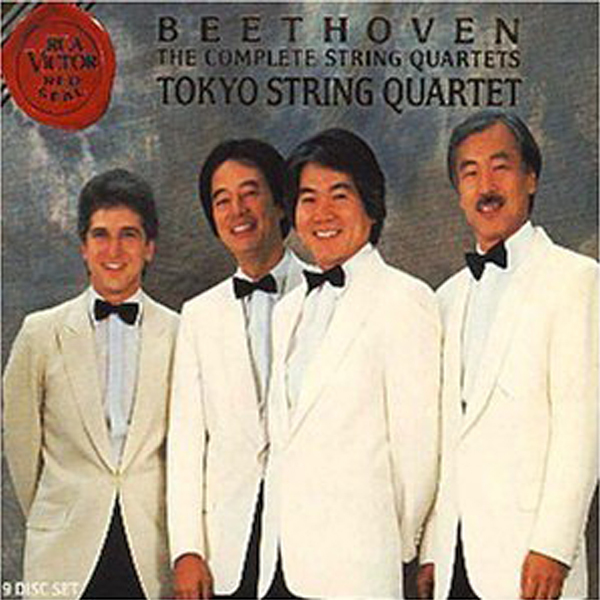 It has been re-issued (where else) on Tower Records' label. Mono. 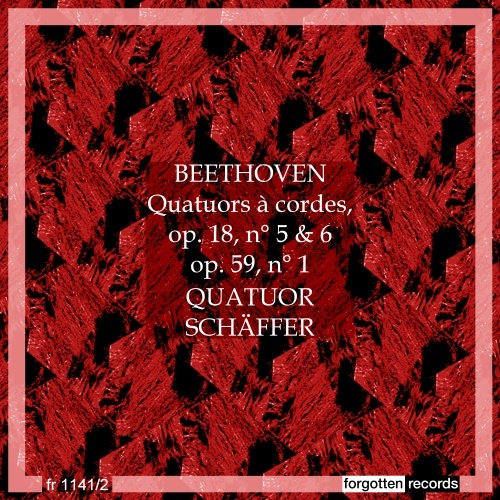 This cycle by the Schäffer-Quartett (or "Quatuor Schaeffer") was issued by the short-lived Le Club Français Du Disque, which existed from 1953 until 1968. 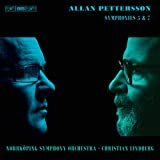 Forgotten Records has digitally remastered the recordings from LPs. 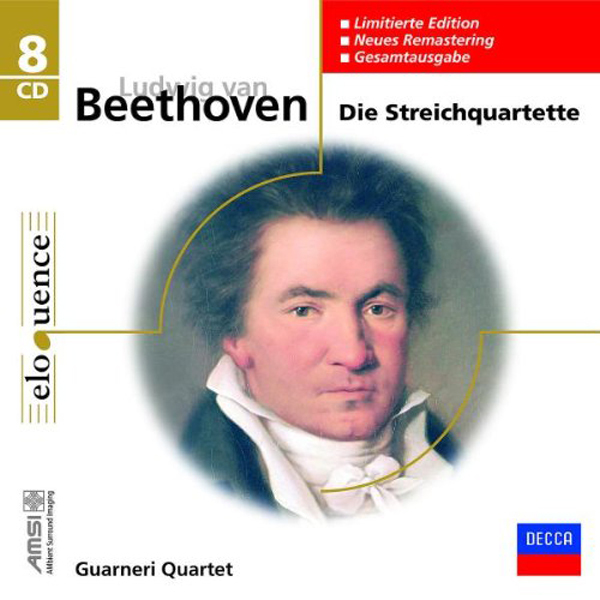 It seems to be two quartets shy of a complete cycle (either in the original or the re-issue), namely opp.18/2 & 3. 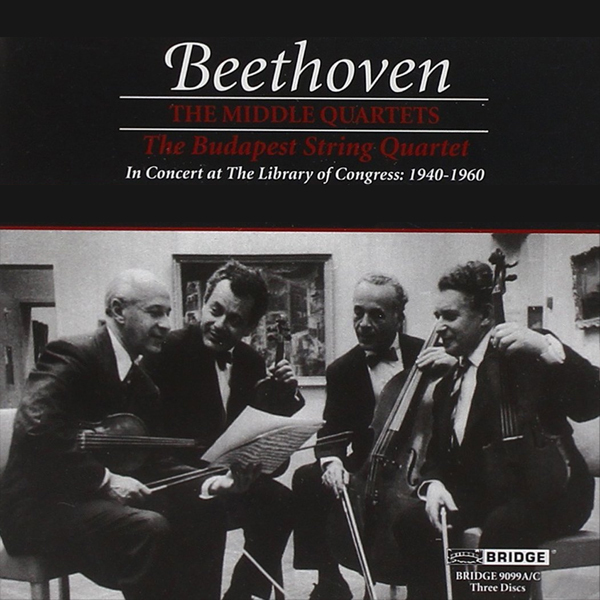 This is a (complete) patchwork cycle compiled from Library of Congress performances of the Budapest Quartet put together by Bridge. 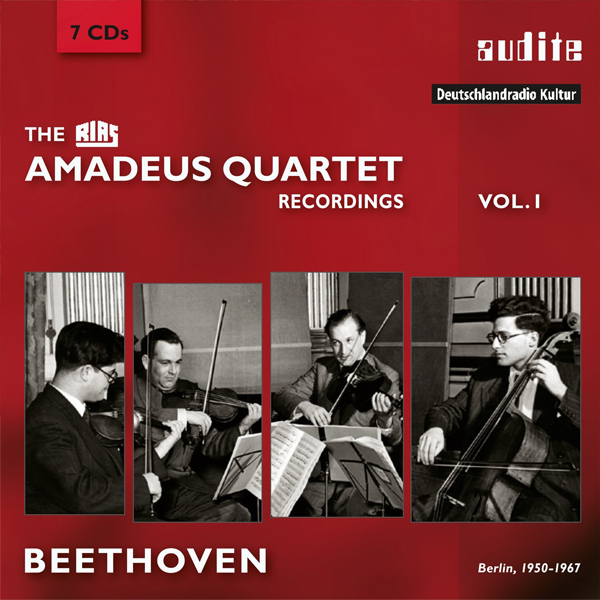 This is the first cycle of the Amadeus Auartet, recorded for the Berlin RIAS radio station and beautifully restored and released on Audite. 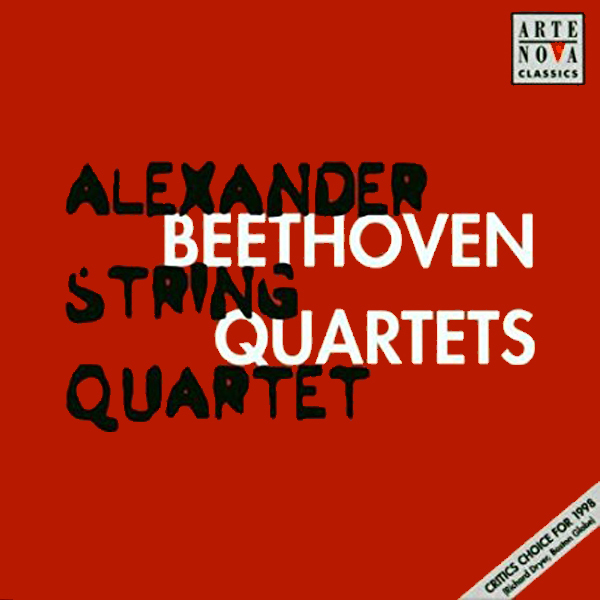 It includes the op.29 Quintet but lacks op.74; op.127 is taken from a non-RIAS broadcast in 1967. Mono. 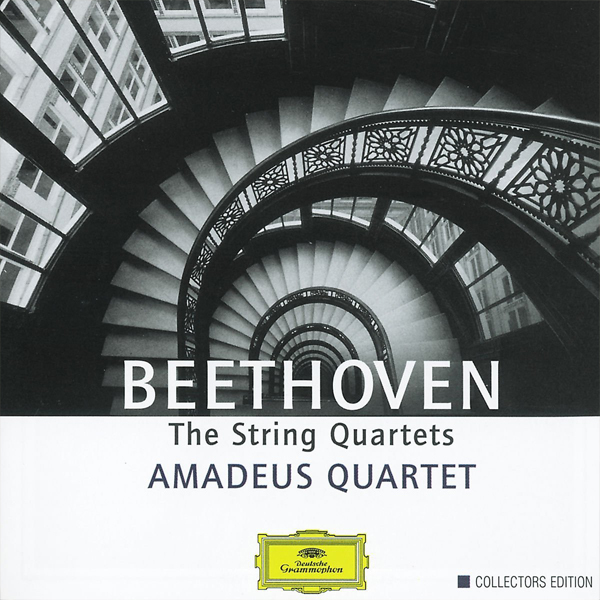 The classic Amadeus Quartet cycle on DG; long the dominant name in the UK not the least thanks to the unique position of the Amadeus Quartet in post-War London. 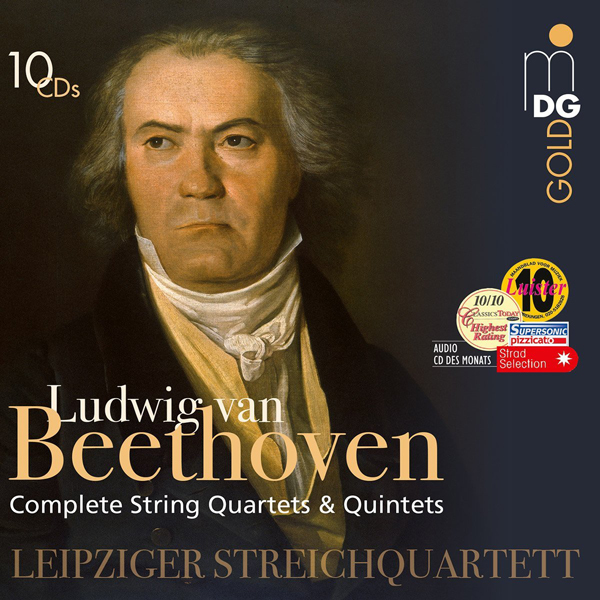 It has now (2019) been lavishly re-issued as a set of 7 CDs and a pure audio Blu-ray with the original cover art in mini-LP sleeves inside a box. 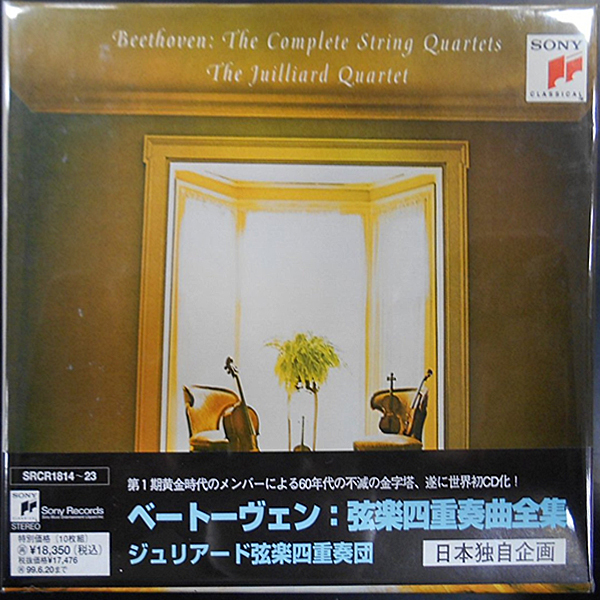 Although the CDs seem not to have undergone remastering, I was very pleasantly surprised even by their sound quality. 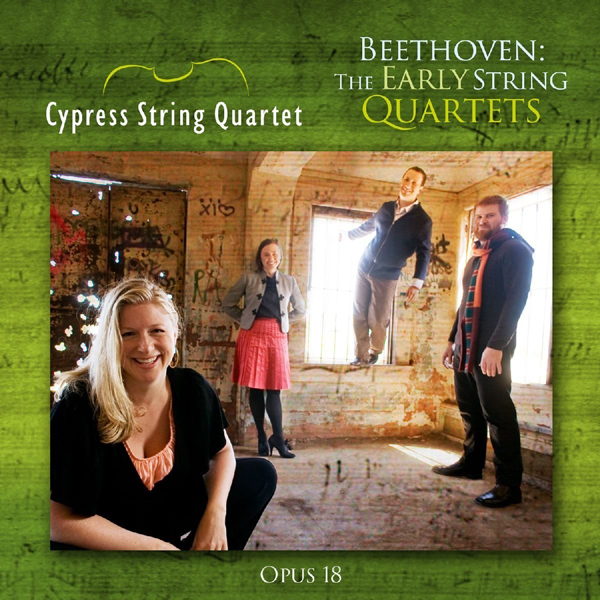 I noticed little to nothing of the harshness that I had hitherto heard attributed to the previous CD releases. 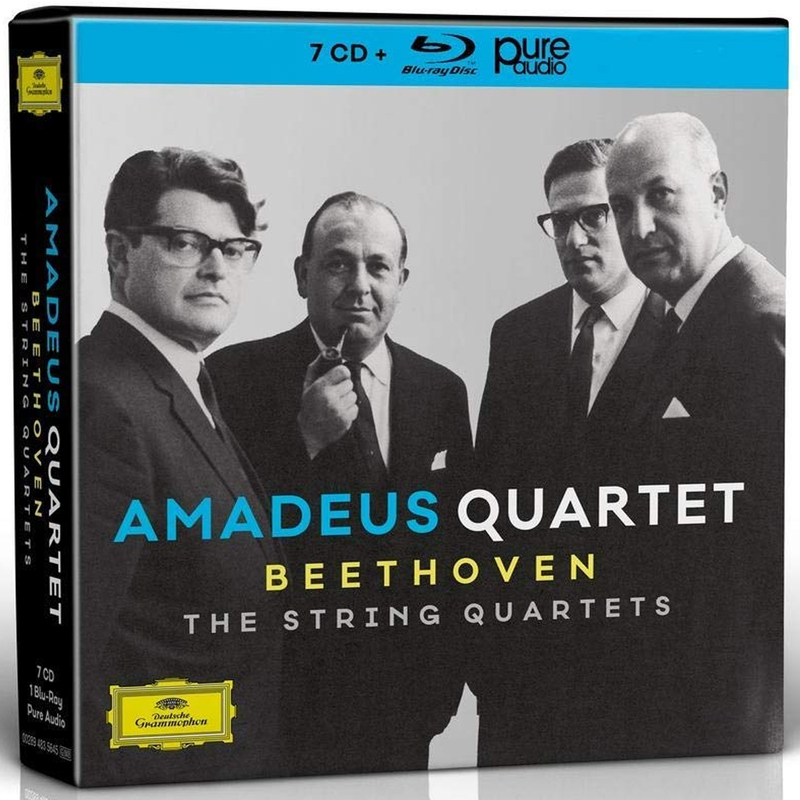 As for the Blu-ray transfer (which I have yet to listen to), the engineer had the following to say: "We have used the digital high-res transfers from the original tapes [for the Blu-ray mastering]. 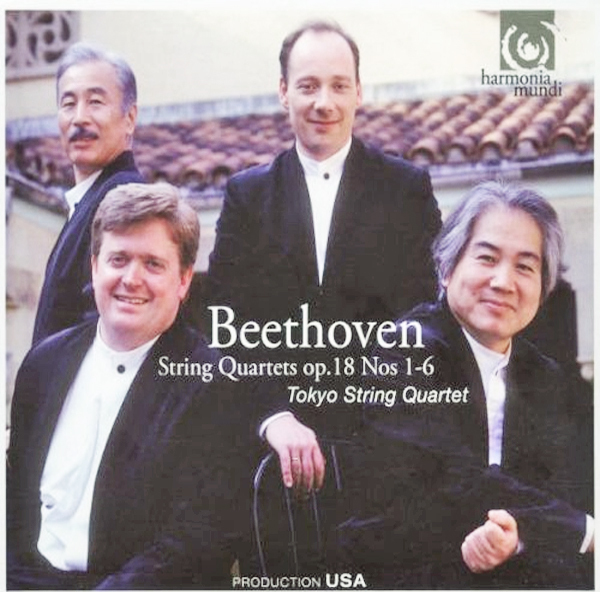 Our goal was to keep the spirit and the character of the original recordings. 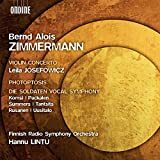 We have been cleaning up and retouching the files to make the whole user experience [a bit smoother], but always stayed close to the original recording and kept the original dynamics, as with Blu-ray there is a much bigger dynamic range (24 Bit) compared to CD (16 Bit)." 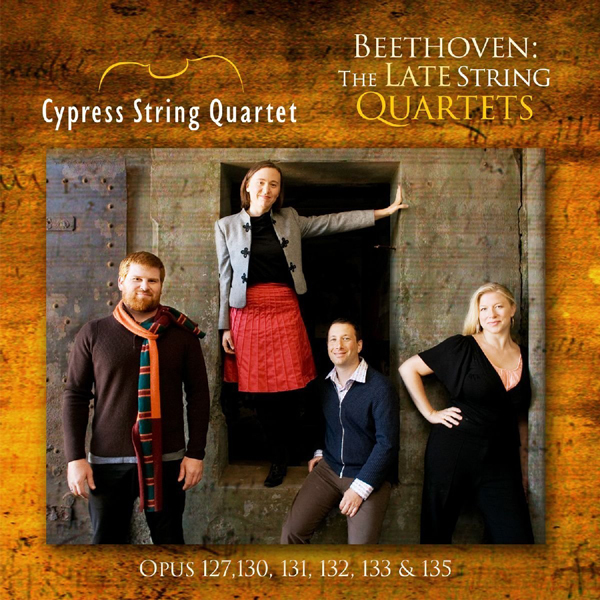 A cyle from what was, for a few decades, Chicago's premiere string quartet. 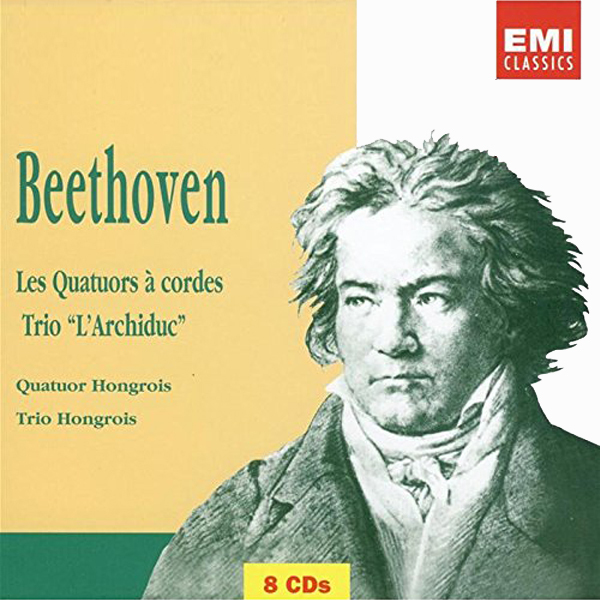 This is the stereo re-make of the Hungarians' Beethoven cycle, but somehow it has been neglected on CD, appearing only on French EMI with any regularity. It is currently OOP. 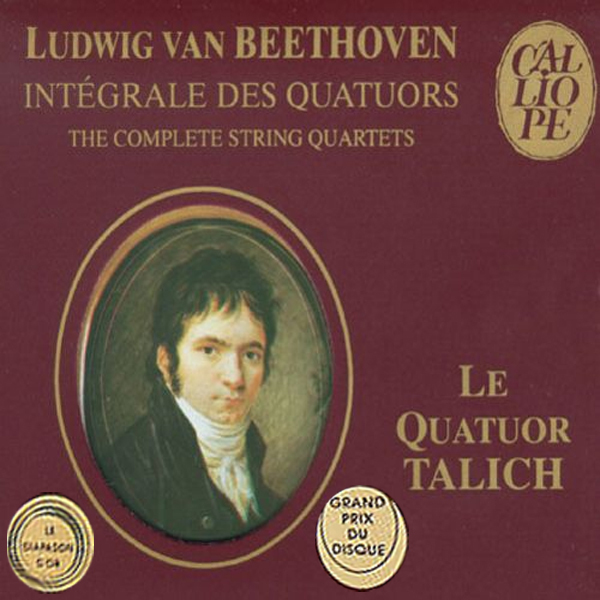 The Vlach Quartet recorded a famous op.131 and op.18 for Supraphon, but not a complete cycle, apparently. 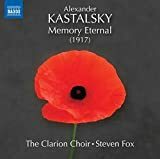 This seems to be a live cycle made up of altogether different recordings, taken from radio broadcasts, although I have seen it claimed a studio cycle as well. 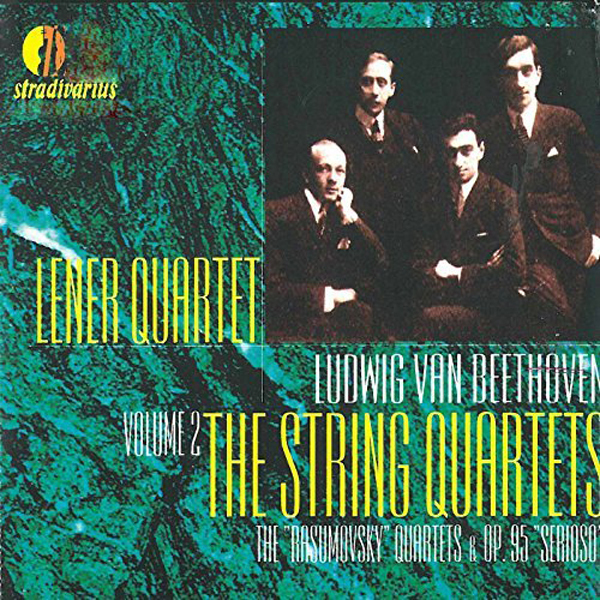 (Op.130 is taken by the Janáček String Quartet.) Mono/Stereo. 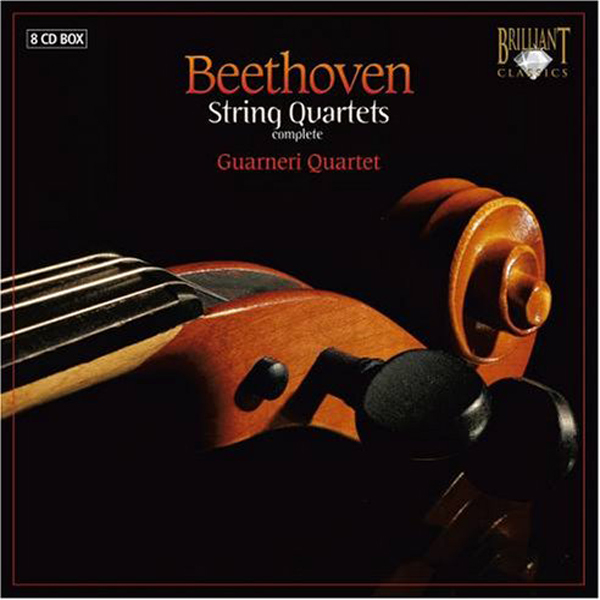 This is the first of the Guarneri's two LvB String Quartet cycles and the one that has gotten more play on CD. All the same, it is currently OOP and most easily acquired in the three RCA boxes. 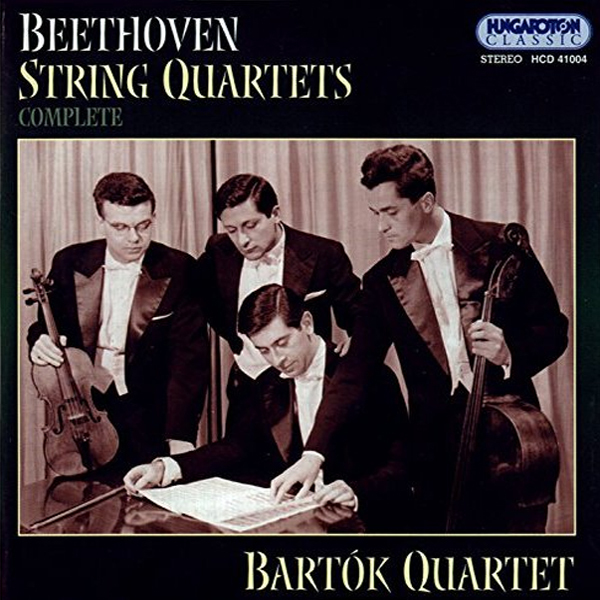 There was an earlier attempt at recording a Beethoven Cycle with the Juilliard Quartet between 1959 and 1963, but perhaps not a very concertated effort. 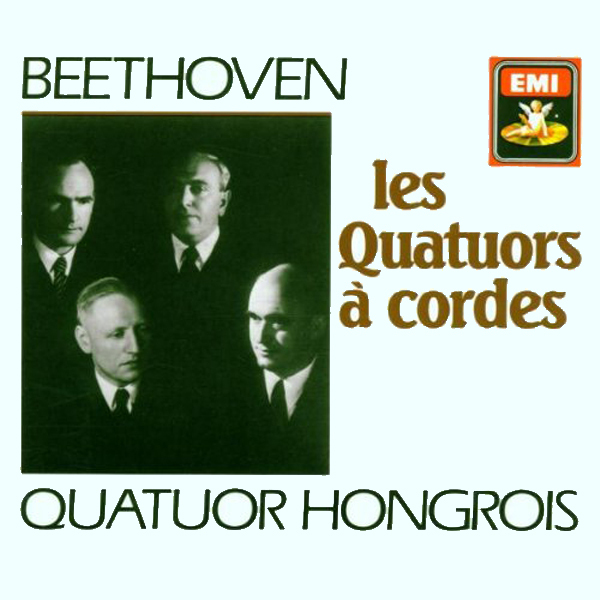 In any case, the ensemble (consisting of Robert Mann, Isidore Cohen, Raphael Hillyer, Claus Adam) only put down 5 quartets for RCA, which were never released on CD, as far as I know. This is then their first cycle, it hasn't been consistently in print, but (strangely?) 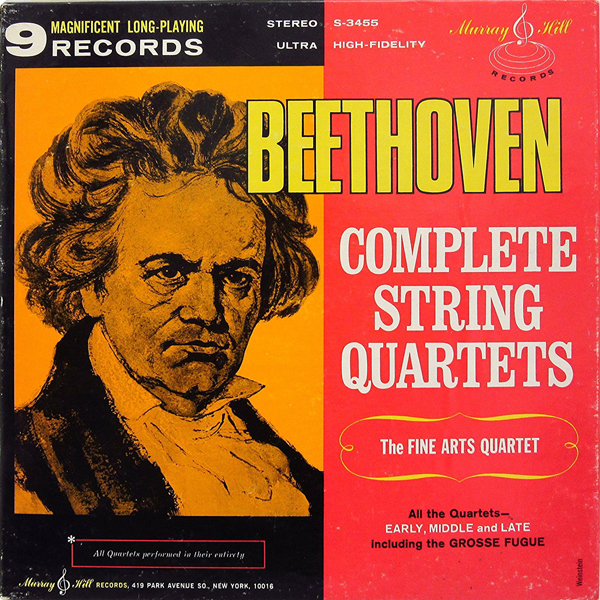 it is the only one that was ever issued as a single box set. 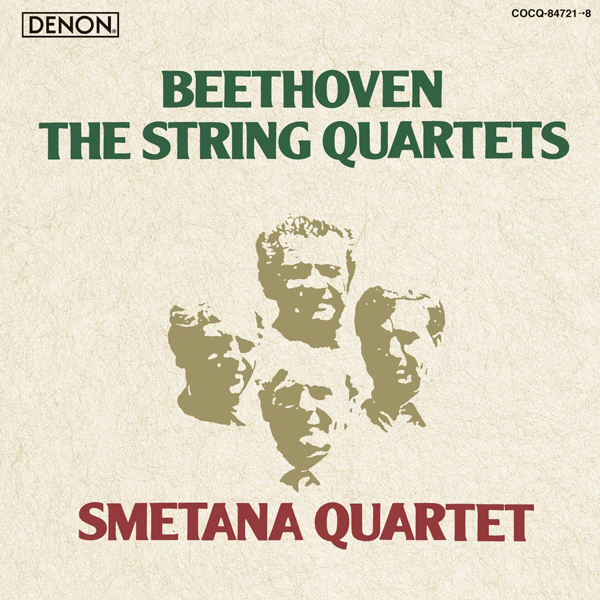 This was the first attempt of the Smetana Quartet at a Beethoven cycle. 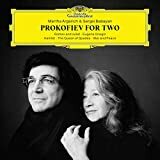 They got close, but are missing op.18/2-6, op.59/1/2, and op.74. 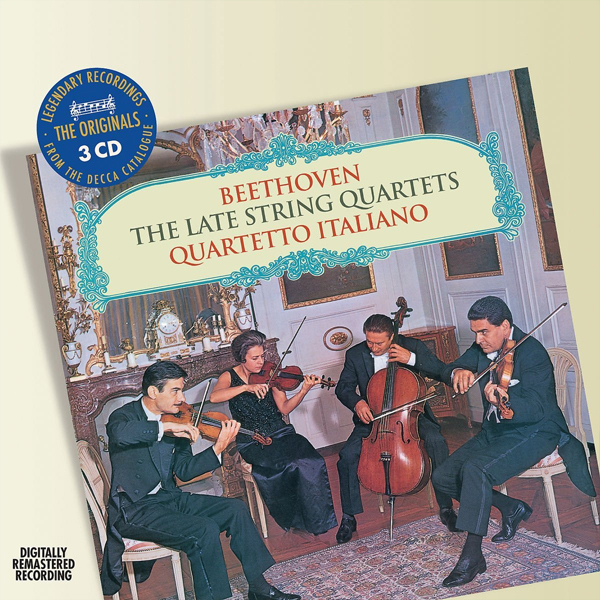 It was issued on Supraphon and the late quartets have been re-issued on a Supraphon 3-disc set which, lacking anything more encompassing, I have included it here... 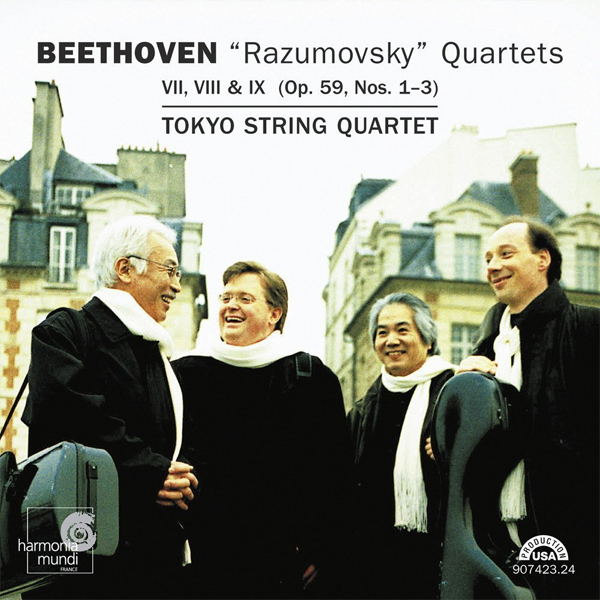 The late quartets have also been re-issued on single discs in Japan, but I haven't found the missing opp.18/1 & Razumovskys on CD anywhere. This was a hard set to learn about, much less attain any detail about it... In passing, Tully Potter notes "very dry playing", but - going easy on differentiation or nuance - suggests this is equally true of both their sets. 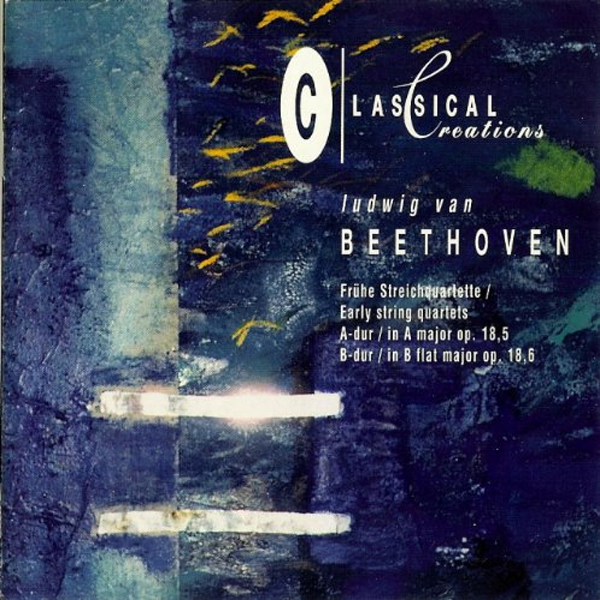 Some or all of these recordings seem to have been re-issued on a series titled "Classical Creations"... 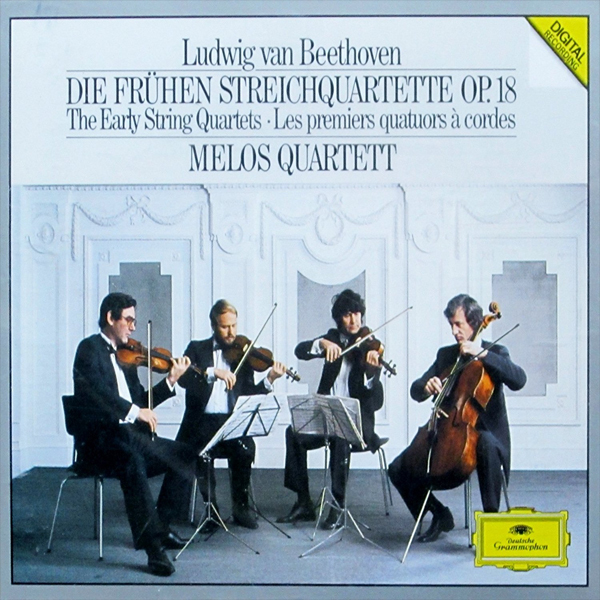 I could only find such releases for the early string quartets, which include the SQ4t version of op.14/1. 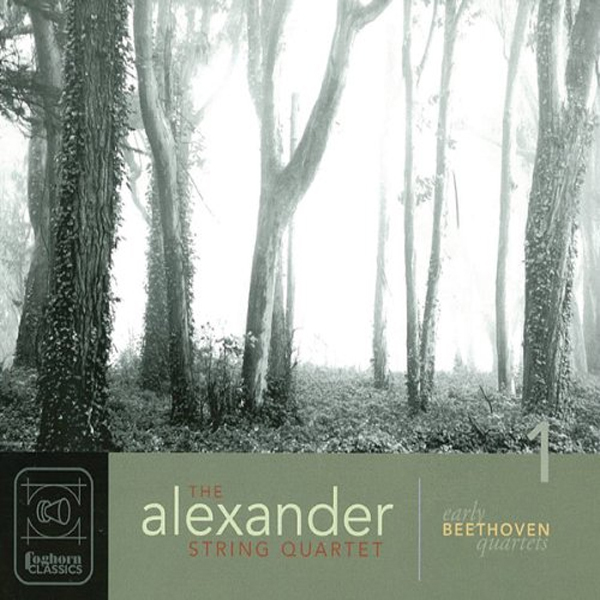 An easily overlooked cycle with which I am not familiar; Tully Potter credits it with "exceptionally intense" playing. 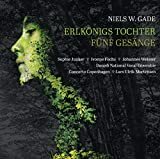 It seems OOP these days, but it can be downloaded (see below) and can be found in the Naxos Music Library. 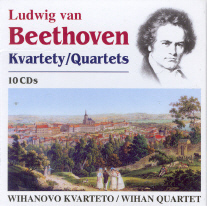 This set is still my reference for musicality and passion and Beethovenian ember... especially in the Razumovsky quartets. I love it, perhaps beyond purely rational, objective reasons. 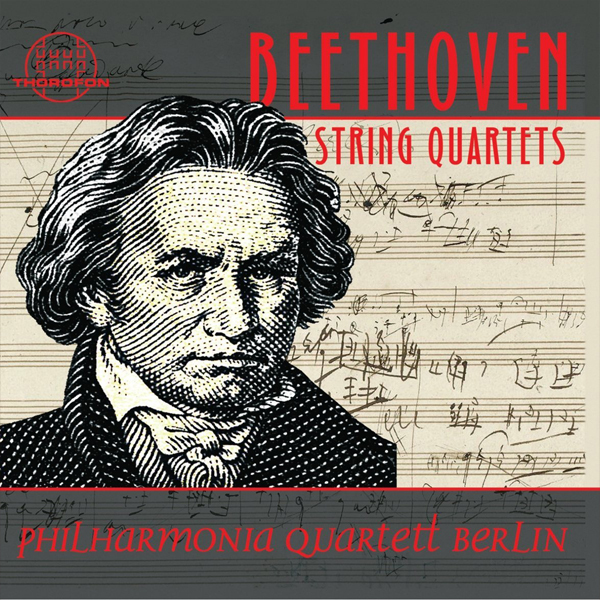 At least in Europe, this was one of the great, popular Beethoven String Quartet cycles to come along in the modern era... successors in fame, perhaps, to the Amadeus' cycle. 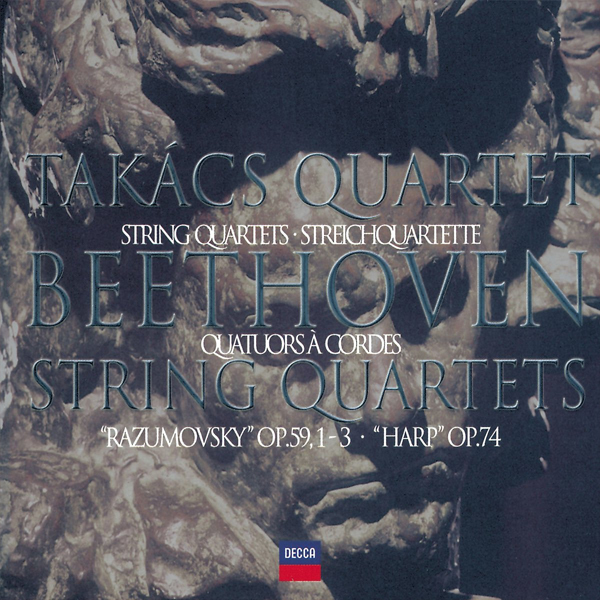 It's always been around on CD in some form or another and Pentatone even re-issued the Razumovsky quartets on SACD to give listeners with the corresponding set-up the possibility to enjoy them in Philip's pioneering if largely ignored quadrophonic sound. 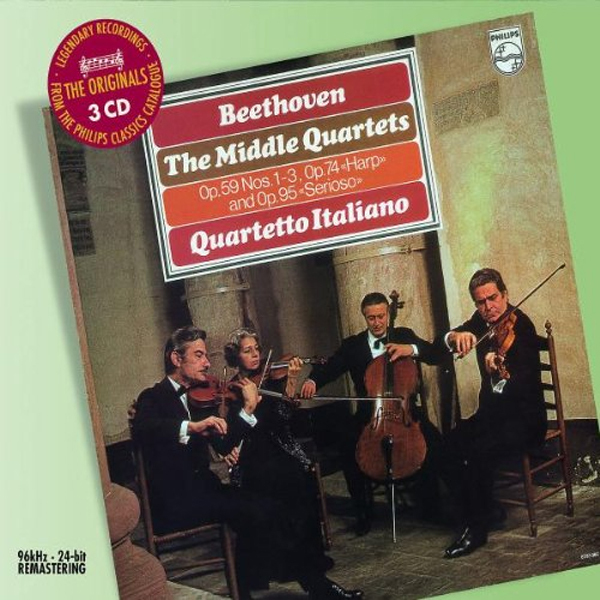 The Quartetto Italiano are perhaps the premiere beauticians among Beethoven-playing quartets; their tone is sweet and gorgeous and fairly untroubled. This is their great strength to some - and weakness to others. 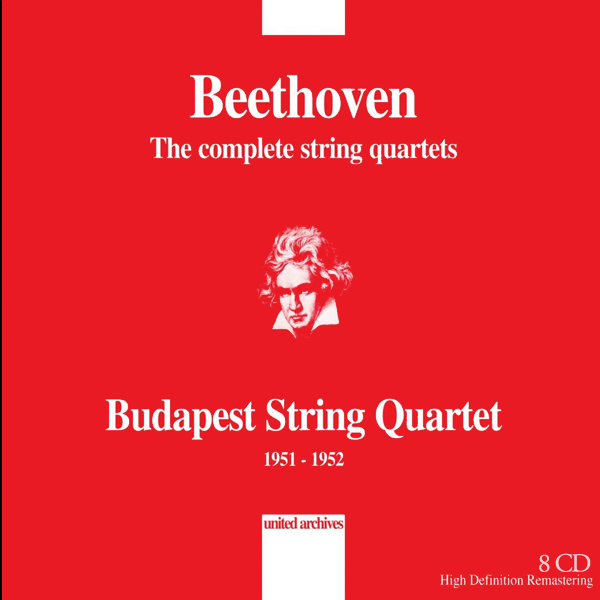 I don't like cross-composer box sets much, but for those not hampered by such considerations, there is a 37-CD catch-all set with all their recordings on Decca, Philips & DG, which includes their complete Beethoven, naturally, and a disc of 1949/52 recordings of Razumovsky 1 & 3. 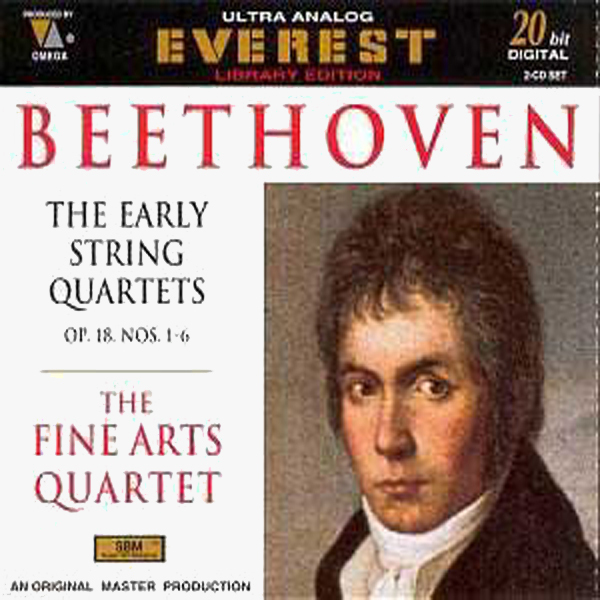 The Cleveland Quartet's first cycle, on RCA, never made it into the digital age for one reason or another. 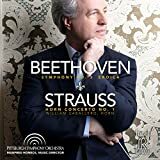 Here's a review from the NYT previewing the recording(s). 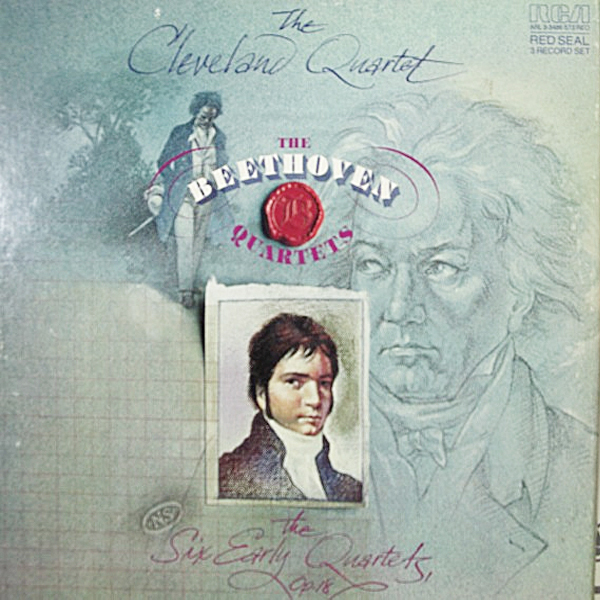 Neatly, the Cleveland Quartet's historical website allows you to stream all their out of print recordings. 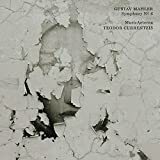 The GDR cycle, recorded for VEB Schallplatten/Eterna, re-issued on CD by Edel and re-re-issued on Brilliant. 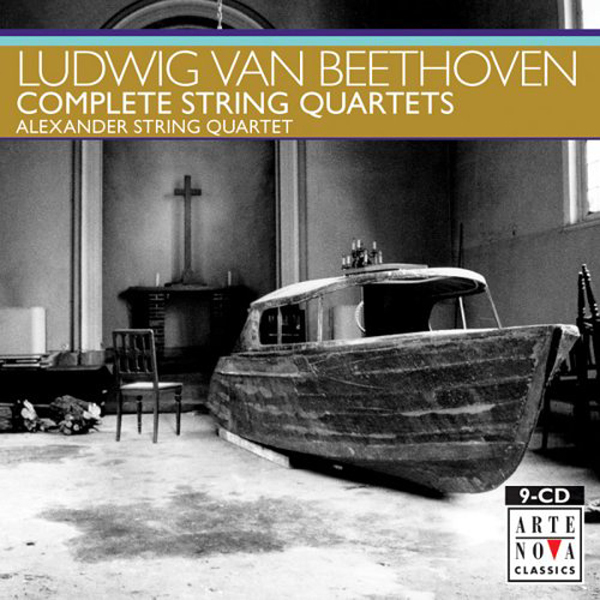 Well worth exploring, from what I hear... and on my list of recordings to be sought out. 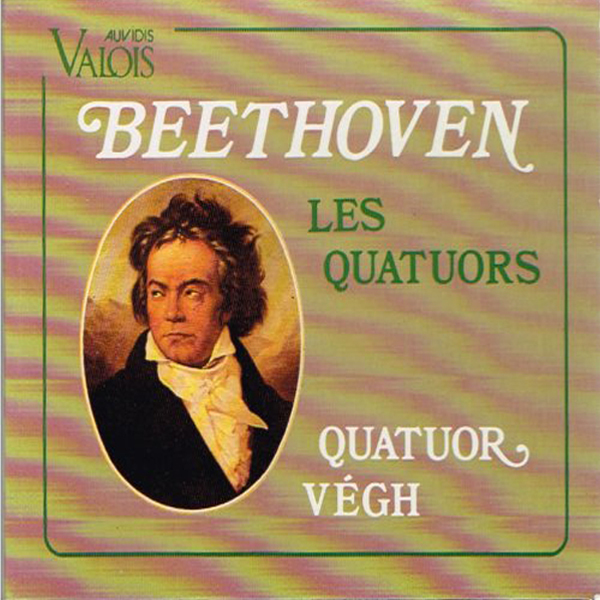 Among the internationally most consistently highly regarded cycles, in the line of Végh II but in modern analog sonics. Supremely gorgeous re-issue from La Dolce Volta sweetens the deal further! 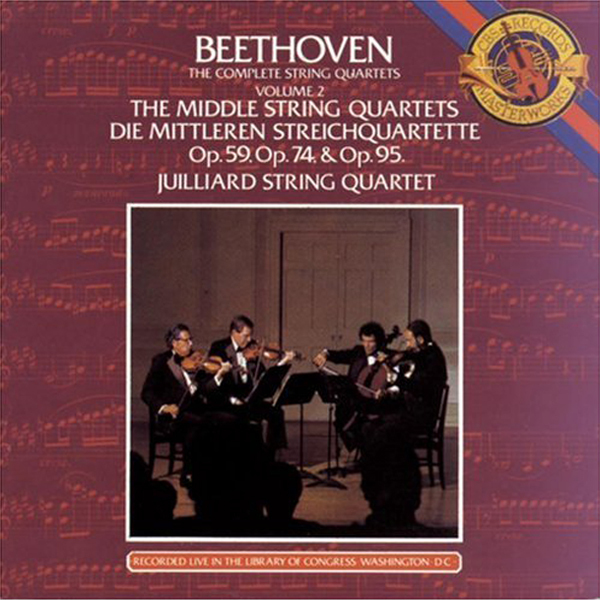 The Juilliard Quartet's Beethoven at the Library of Congress was something even I still got to enjoy, although not, of course, at the time these recordings were made in 1982, nor with that lineup. 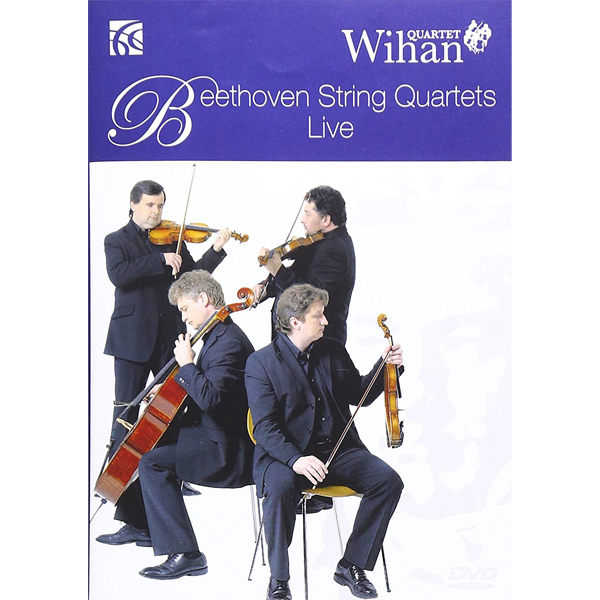 The resulting live recordings were never issued as a complete set but were, at least in their time and in the US, considered top-notch stuff. It seems currently OOP. When this set came out, it set a new standard for excellence -- in particular technical excellence. 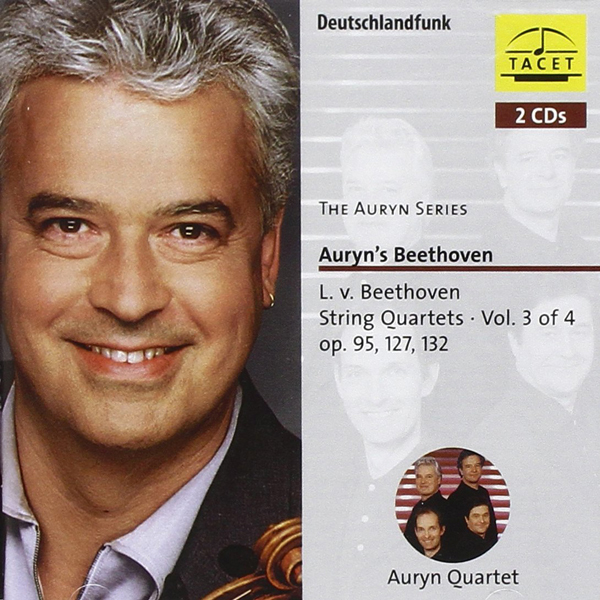 There simply had not been as precisely played a Beethoven cycle before that. 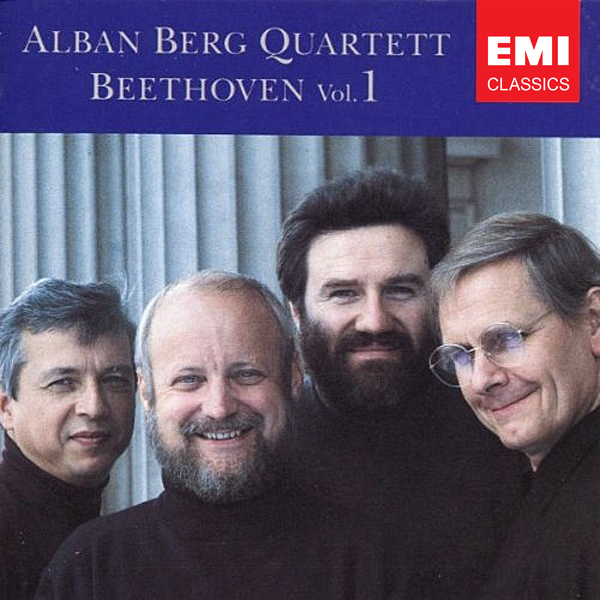 The four perfectionists of the Alban Berg Quartet, who built their fame seat-by-seat, starting with a cycle of performances at the small Schubert Hall of the Vienna Konzerthaus and then gradually growing this into a world-wide following, delivered something that remains an easily competitive - if contentuous - top choice, today. 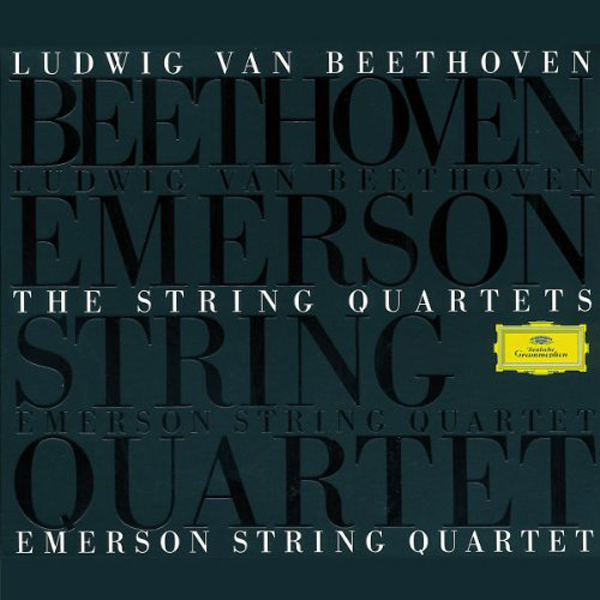 Some say it's never been surpassed and that they set entirely new standards to which ensembles like the Emerson Quartet would later aspire to. 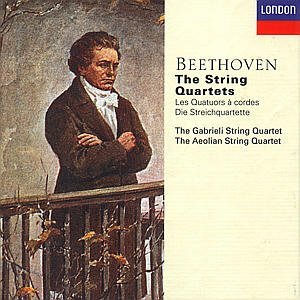 I have managed to be swayed by the more negative viewpoint for far too long and am going to try them out myself at long overdue last... especially given how much of a dog's breakfast even contemporary string quartets manage to make out of some of the trickier passages in the late quartets, I could well possibly use a dose of perfection. 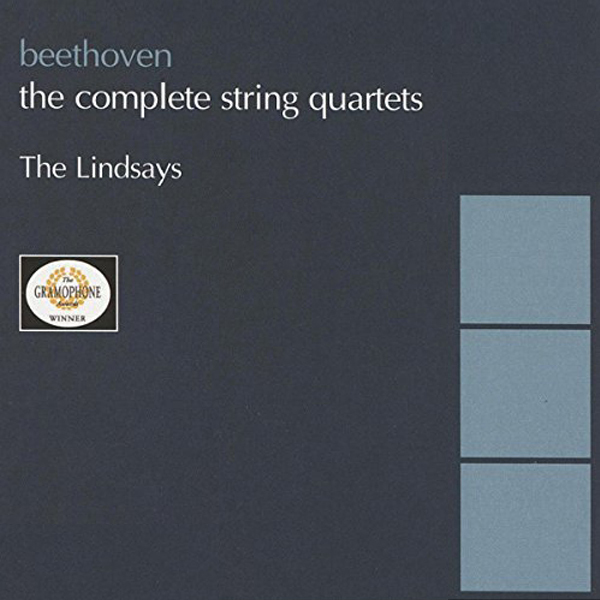 The Lindsay String Quartet - not then "The Lindsays" - recorded this, their first, Beethoven cycle to hyperbolic acclaim in the UK and to derision elsewhere. "So much heart!" claimed the former; "But so rarely with the correct intontation!" objected the others. 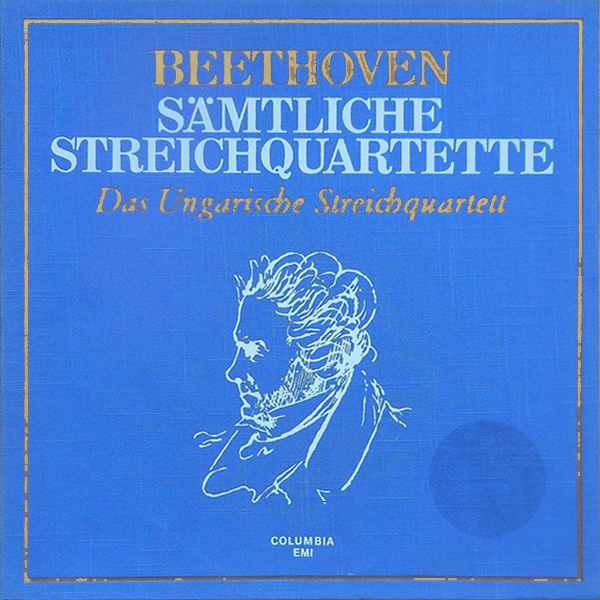 Much the same with their late Schubert, which I haven't listened to in a long time but which I remember loving very dearly... their Beethoven, alas, I have not heard. It came out on ASV. 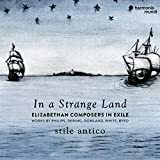 In the US it was also issued as a set by the Musical Heritage Society and later by that - to me - mysterious Sanctuary Resonance label/series that did a few Lindsays boxes and nothing else that I noticed... and then disappeared again. 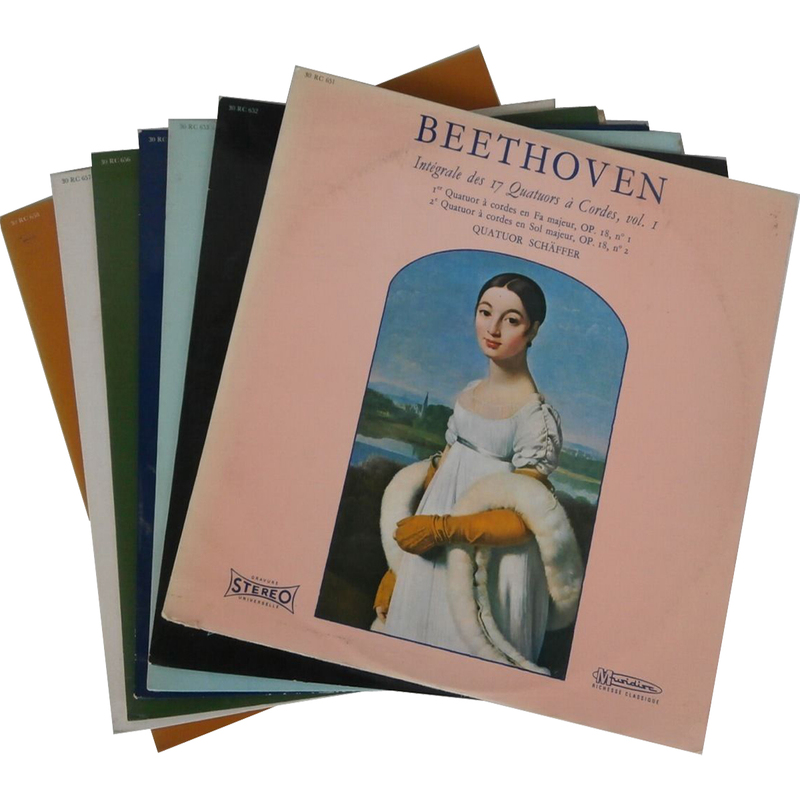 I know nothing about this set, really, but a factoid: The LPs of it, which were issued alongside the CD and Cassette releases, had the CD booklet rather than its own, proper-sized one. 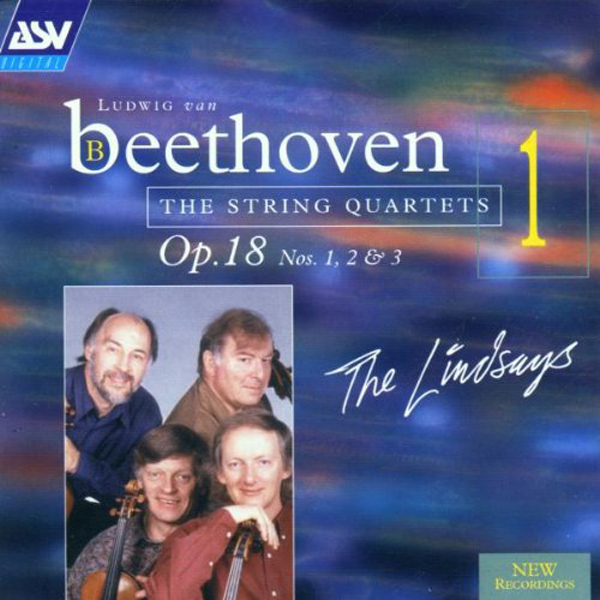 Andrew L. Pincus wrote about this set in the New York Times: "Two recent boxes of recordings provide explorations not just of Beethoven's familiar music but also of the personalities of two European ensembles, the Melos and Lindsay string quartets. By the end of the road, the Melos comes to seem like an expensively tailored companion, elegant from his cologne and silver cuff links down to his polished shoes. The Lindsay behaves more like a rumpled, slightly eccentric professor, probably in baggy tweeds and with a pipe stuck in his mouth." 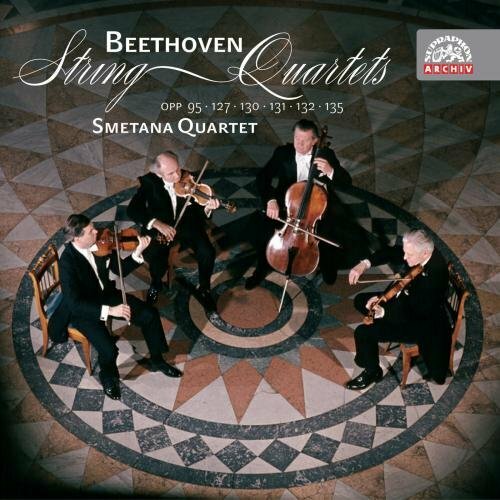 This is the complete cycle of the Smetana Quartet, available through Denon (Columbia Japan). 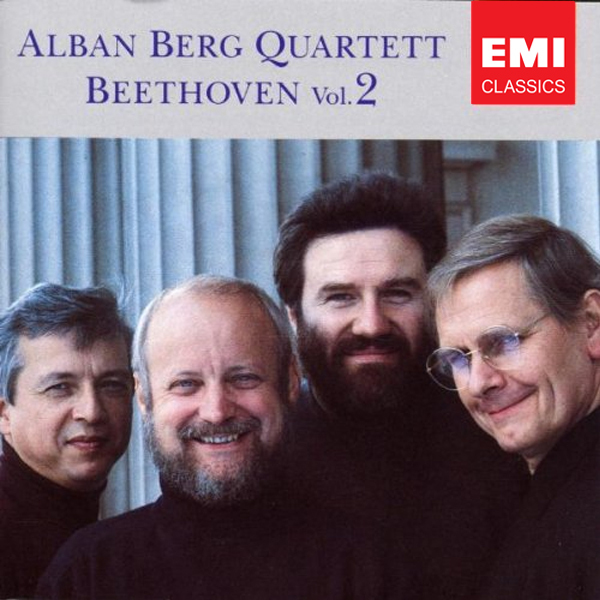 In 1989 the Alban Berg Quartett had the Beethoven cycle they performed at the Vienna Konzerthaus' Mozart Hall recorded and issued it on DVD and CD, figuring that the live atmosphere added a touch of spontaneity to their earlier recordings which, if there were criticized at all, were accused of an all-too-clinical execution. 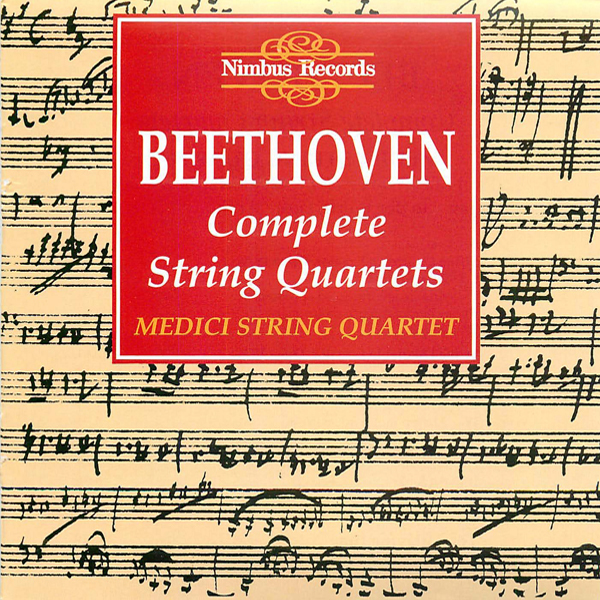 It was issued in two volumes; the late string quartets have been re-issued as a separate box. 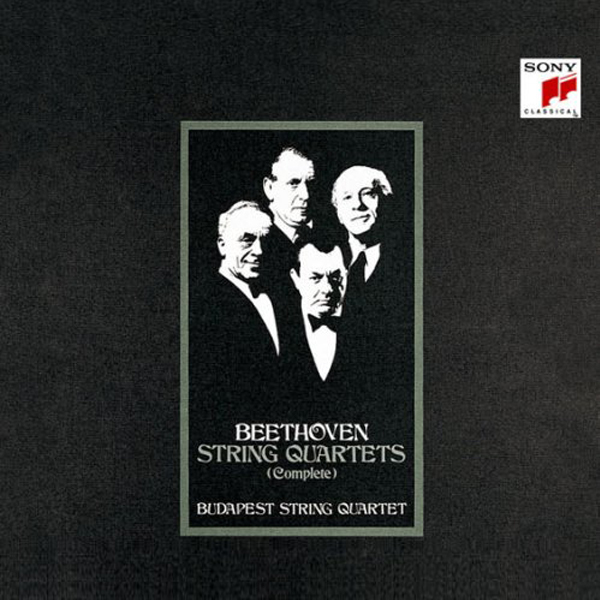 Andrew Dawes, Kenneth Perkins, Terence Helmer/Robert Levine, Dennis Brott/Paul Pulford?/Desmond Hoebig? Canada's contribution to the genre. 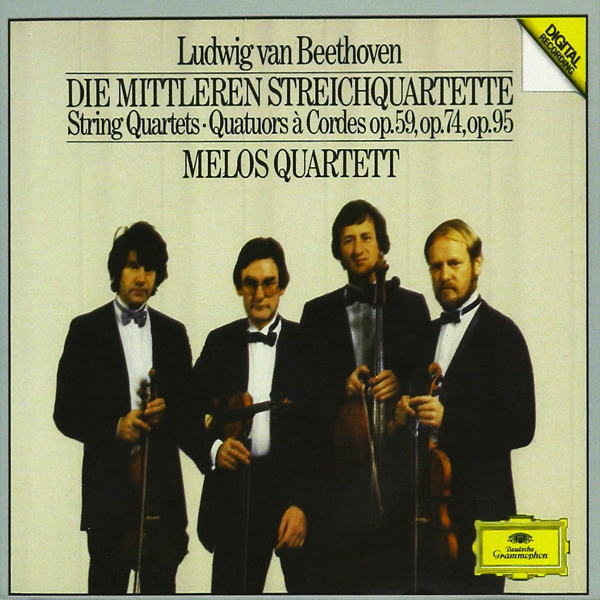 Perhaps a dark horse string quartet cycle; particularly convincing, I found, from op.74 to op.127 + op. 131. 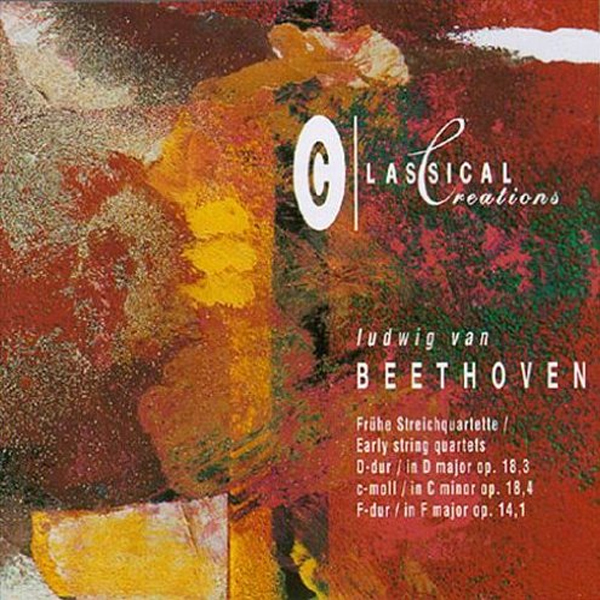 Partly recorded at the famous Siemensvilla studios, like the Amadeus-RIAS cycle. 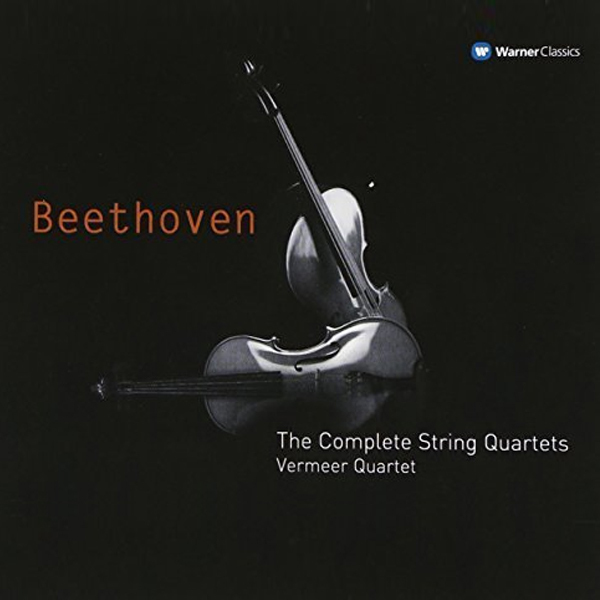 Bernard Holland wrote about opp.130/133 in the NYT: "The Vermeer Quartet values warm and glowing sounds, and its moderate tempos in this performance seem calculated to minimize the opportunity for making ugly ones. 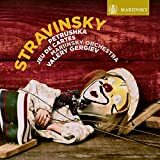 Shmuel Ashkenasi, the first violinist, has a richer tone than his Fitzwilliam counterpart, Christopher Rowland, and he makes graceful phrases, enriched (for better or worse) with generous vibrato. 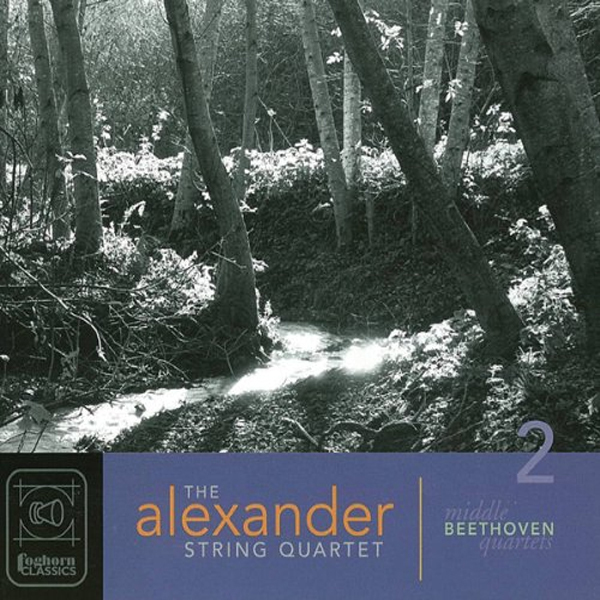 But one must also live with Mr. Ashkenasi's drawling portamento, which in the delicate purity of the Cavatina movement seems oppressive and very much out of place. The Vermeer has the same problems with the Grosse Fuge as everyone else. It is a stubborn, gouging opponent and one which resists the most virtuosic attempts at discipline." The ARD Intl. 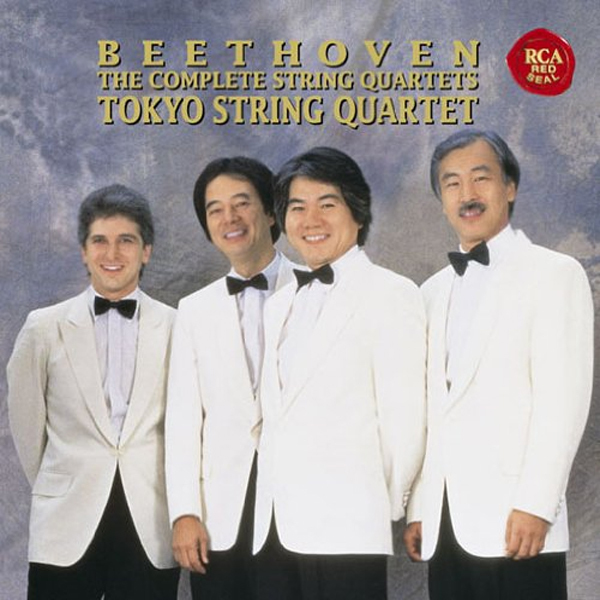 Music Competition Winners, the Tokyo String Quartet - at this point Peter Oundjian having replaced Koichiro Harada and Kikeui Ikeda Yoshiko Nakura at first and second violin, respectively, enter the market with their neat and controlled cycle for RCA. My first one, thanks to the BMG Music Club. 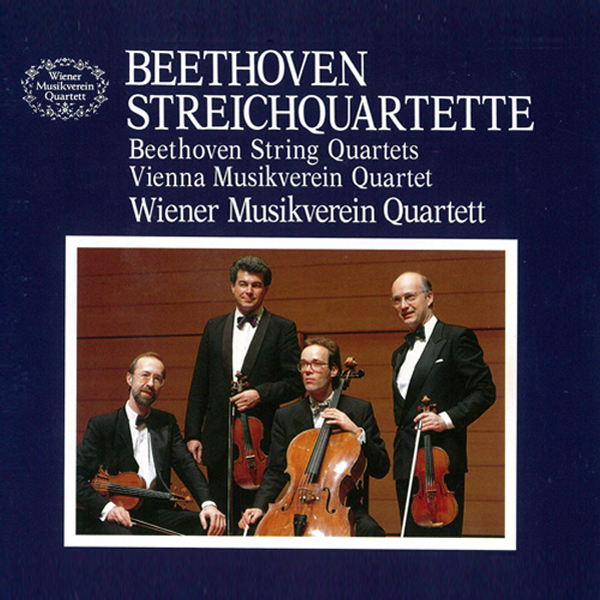 Outside of Europe, the Vienna-based Küchl Quartet goes by the name of "Wiener Musikverein Quartett" to cash in on the great reputation of the Musikverein/Vienna Philharmonic abroad... especially in Japan, where the attitude towards those musical institutions is on the venerating and uncritical side. Needless to say, the quartet is big in Japan. 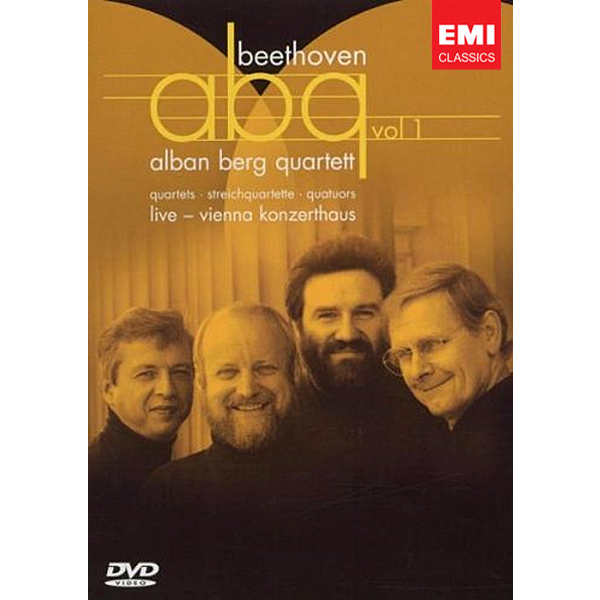 (In Vienna they are considered 'good enough' for the Musikverein's middling chamber music series but could never light a candle to the Alban Berg Quartet which performed their series over at the Konzerthaus - or their successors in that series, the Belcea and Artemis Quartets.) 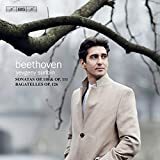 The Küchl's Beethoven cycle, which was never properly available outside of Japan, came out on "Platz" and has even been re-issued by the tireless people of Tower Japan. 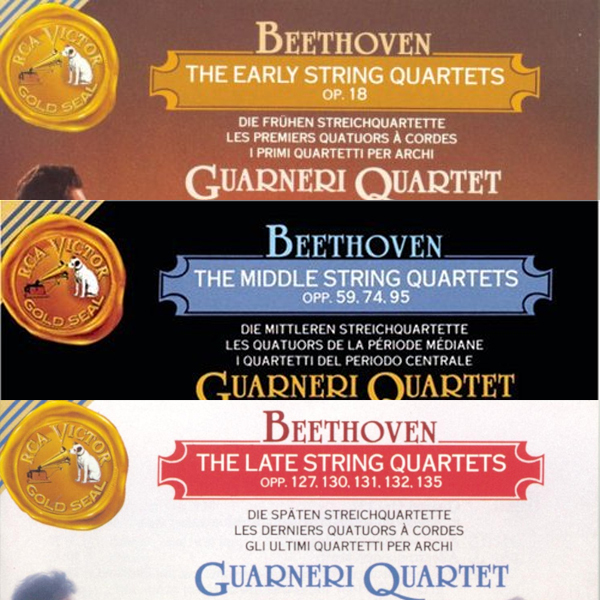 The box set is OOP, but the individual releases [see extra link below] are still in print. 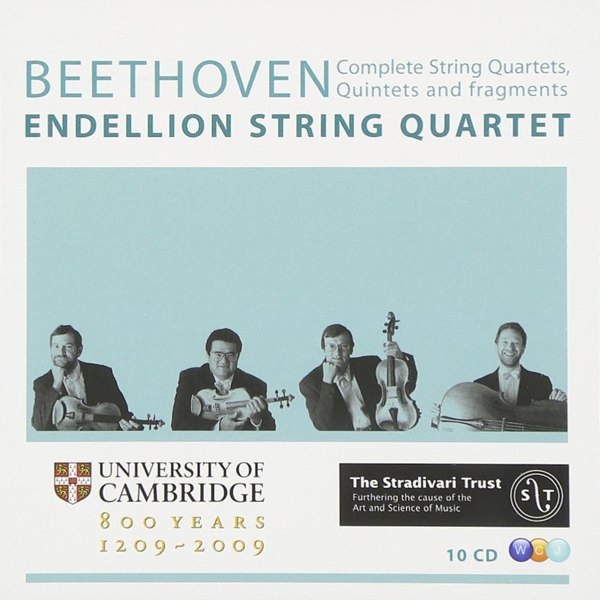 I seem to remember that this set had some legs in the US - but it cannot have helped sales for the Emerson Quartet's to have come out the same year. Ireland's contribution. OOP, although some of the individual releases are still availble. 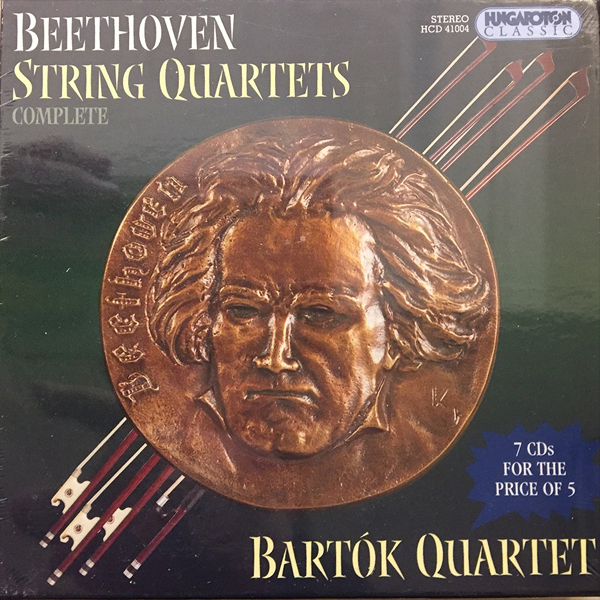 From the Bay Area comes the quartet of well-repuded budget-priced set (when it was in print, at least). 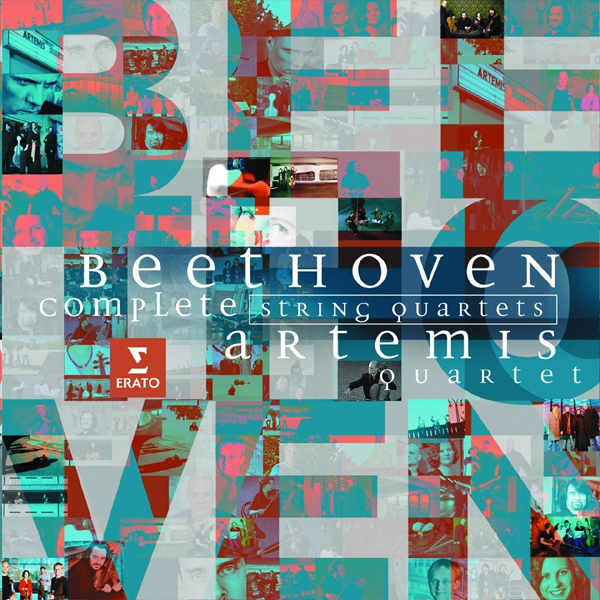 But it never took off anywhere nearly as much (or set such standards) as Arte Nova's set of Beethoven Symphonies with Zinman. Naxos gets into the game. Not available as a box. 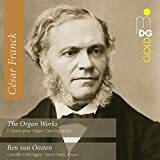 The first cycle to appear on SACDs. 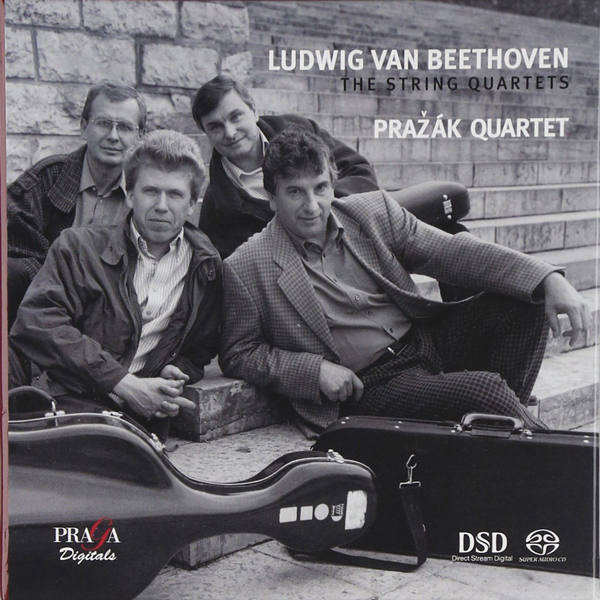 I have long coveted (but never actually acquired) it, not the least because I much enjoyed the Pražák Quartet's performances at the Corcoran Gallery, back in the mid-oughts. The Lindsays (now so re-named) decided that they needed to re-do their cycle for ASV again. It hasn't been boxed, as far as I know. It did not seem to get much traction; ASV was bought by Sanctuary Records and then Sanctuary was bought and shut down by Universal, it appears. 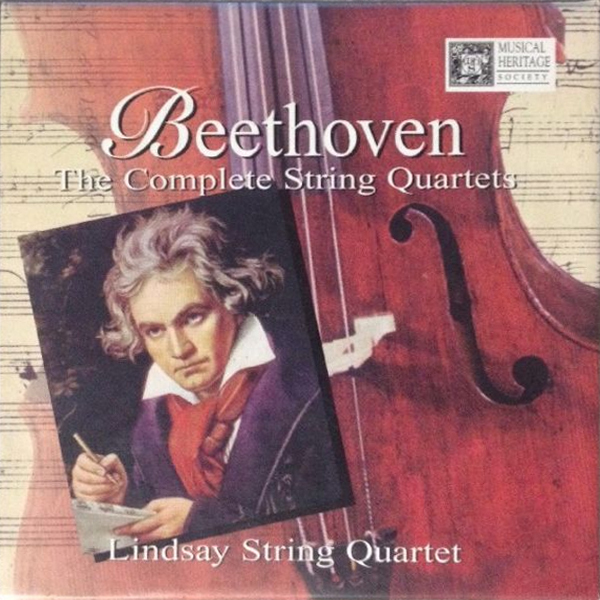 In the US the Lindsays were maligned for allegedly bad intonation, but its fans loved them for expressiveness. 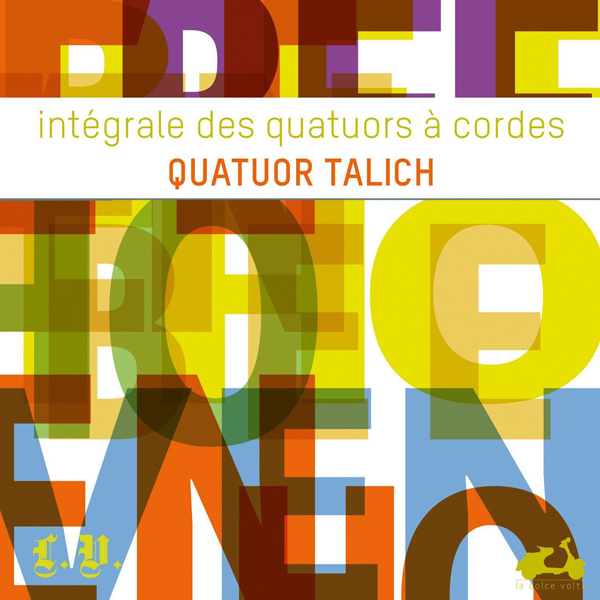 The only cycle available on DVD-Audio (but also on CD) from the audiophile Tacet label. 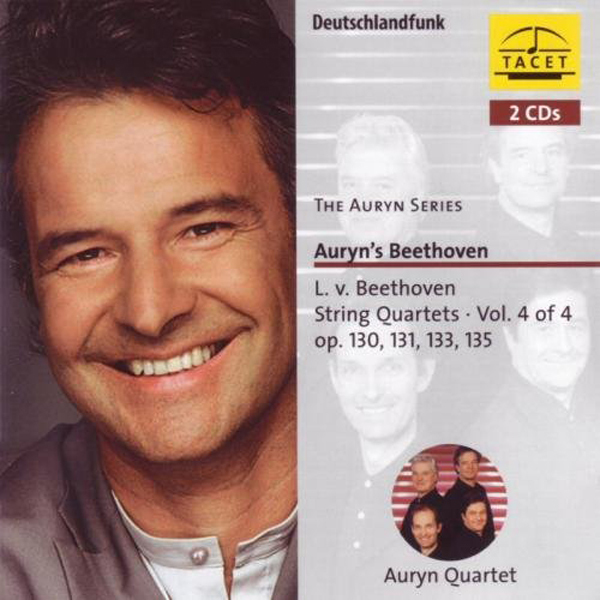 I love the Auryn's Haydn (beautifully played, wilfully old-fashioned, relatively speaking); I am therefore intrigued about their Beethoven. 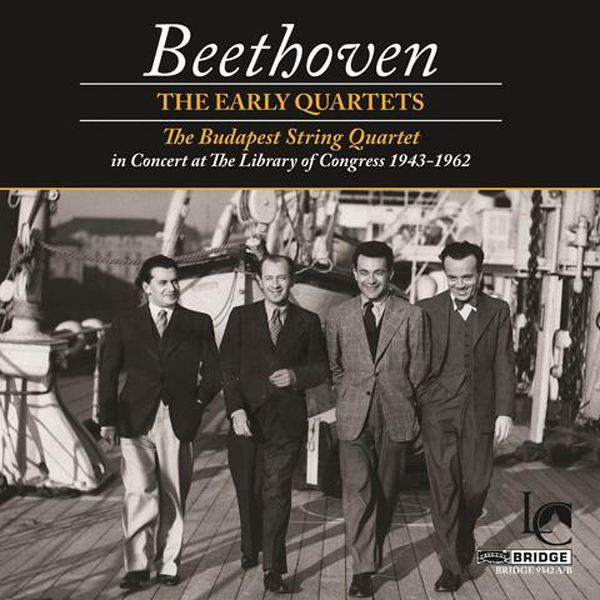 This cycle came at a time in the record industry, where the quartet had to finance the recordings and Decca deigned to publish it. It only turned out to be one of the proudest items in their catalogue and finally, late, it has been given some love in the form of issue as a deluxe boxset including a High-Fidelity Pure Audio Blu-ray cut of the recordings and a bonus DVD. 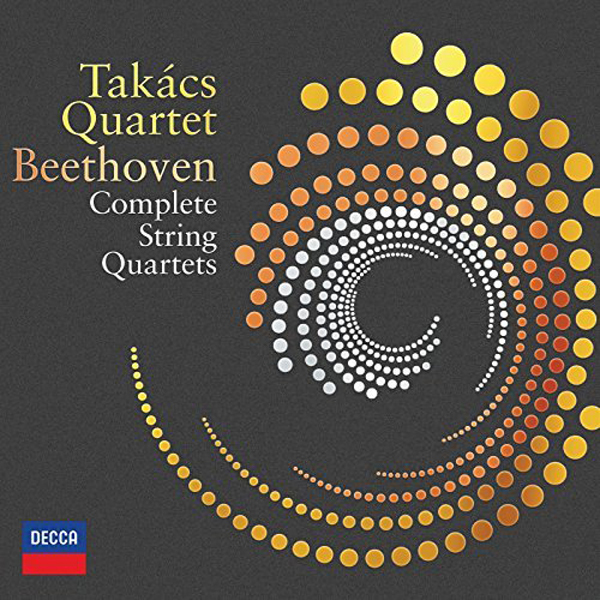 The Takács Quartet has been formative in my appreciation of chamber music—Bartók and Beethoven string quartets in particular and their set, even trying to eliminate positive bias, is my absolute go-to set. 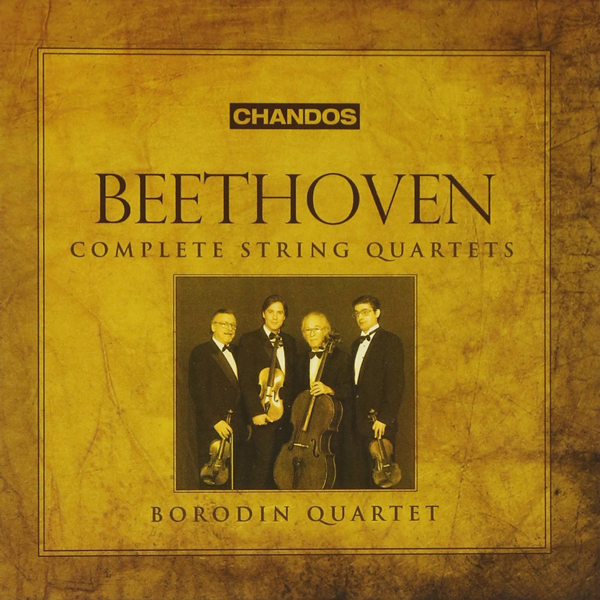 Late, very late in their collective career, the Borodin Quartet took Beethoven to the recording studios for Chandos. 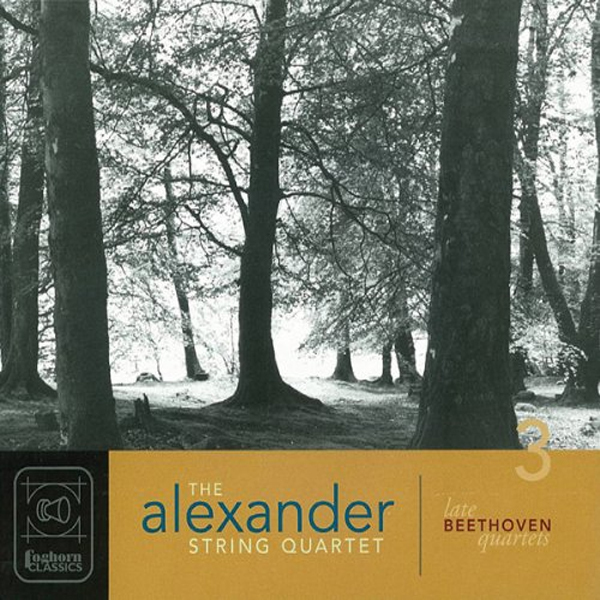 I adore the ensemble in their earlier recordings of Shostakovich [Shostakovich String Quartet Cycle Survey forthcoming! 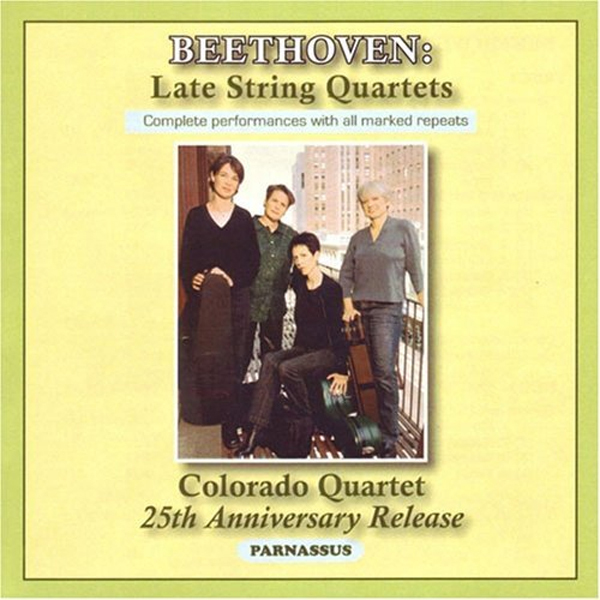 ], but having regularly heard them in concert around that time, I was never particularly interested in this cycle and have, in fact, not heard it. 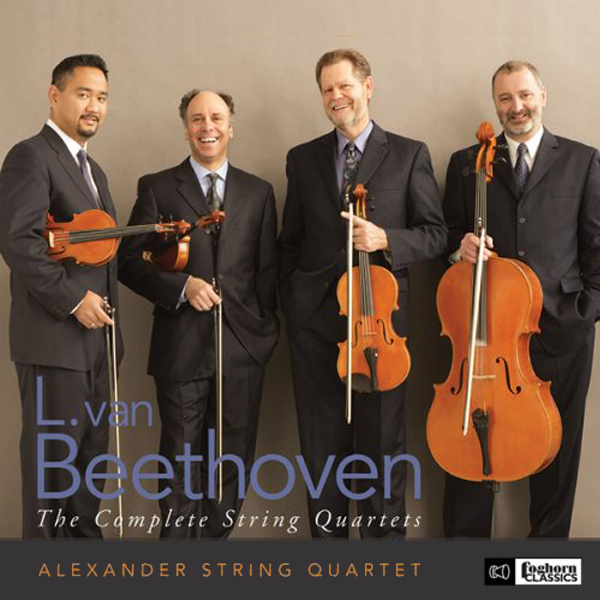 The Alexander String Quartet's second cycle is essentially a fancy promotional issue on behalf of their instrument builder. Not that there is anything wrong with that. 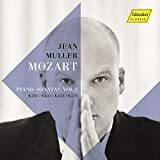 Especially with results like these: their op.18 is absolutely terrific; among the better - indeed among best - I have heard. 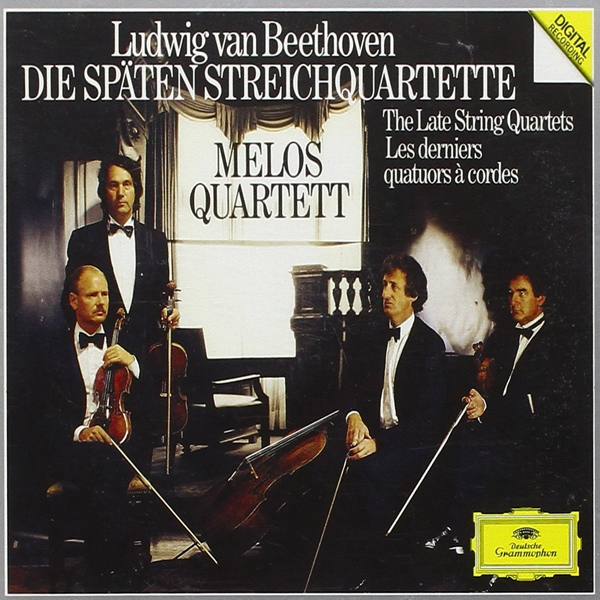 I find that the other quartets, however, do not match that elated status... something that is true for a lot of cycles, except that most don't start out that strong, making it less obvious in those cases. 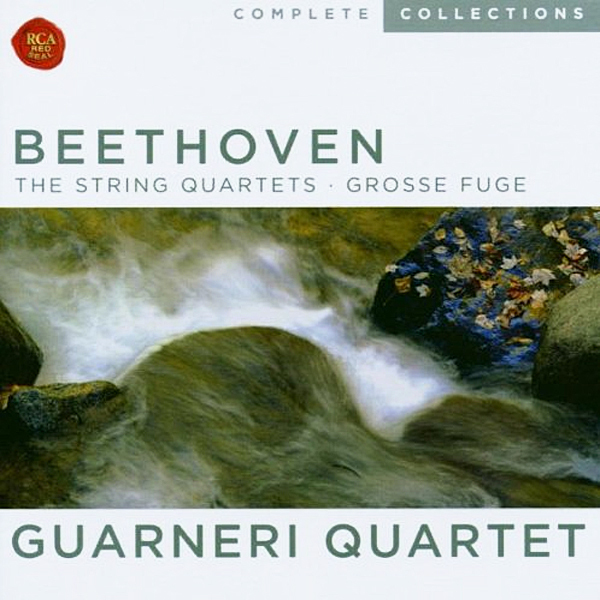 These recordings were made in the Sosnoff Theater of the Richard B Fischer Center at Bard College... and the quartet, founded in 1982 and Winners of the 1983 Naumburg Award and the First Banff International String Quartet Competition, seems to have been disbanded a few years ago. 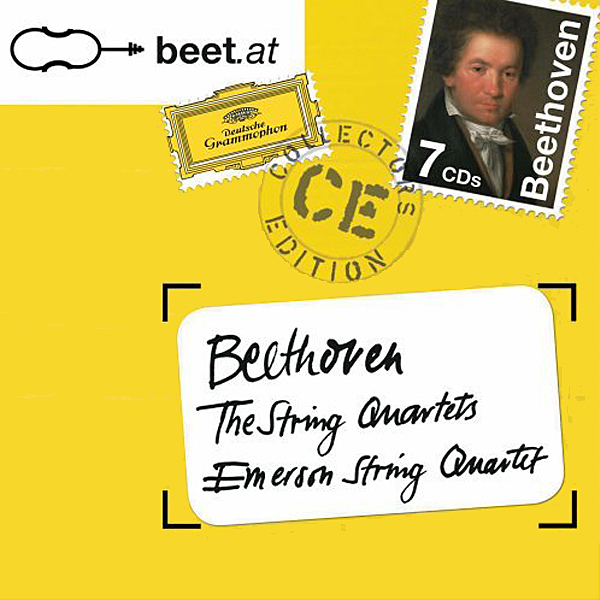 The recordings announce on the cover being "complete performances with all marked repeats". 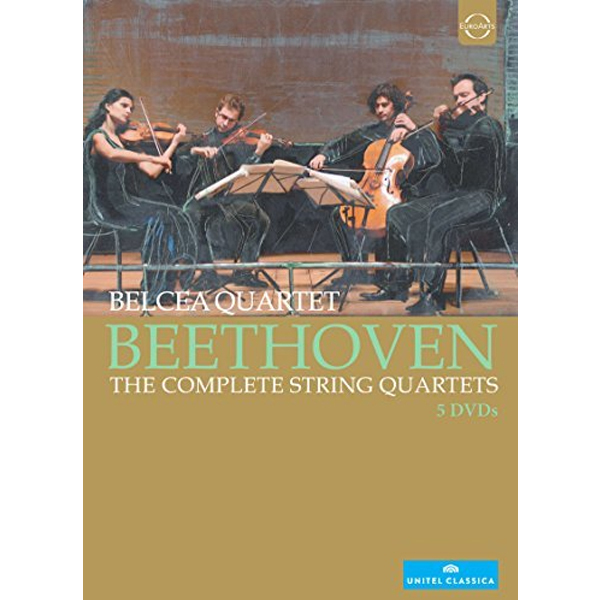 This set markets itself as the absolutely, entirely complete set, with every bit and scrap that Beethoven wrote for String Quartet included - and using the new Jonathan Del Mar prepared edition of the quartets. 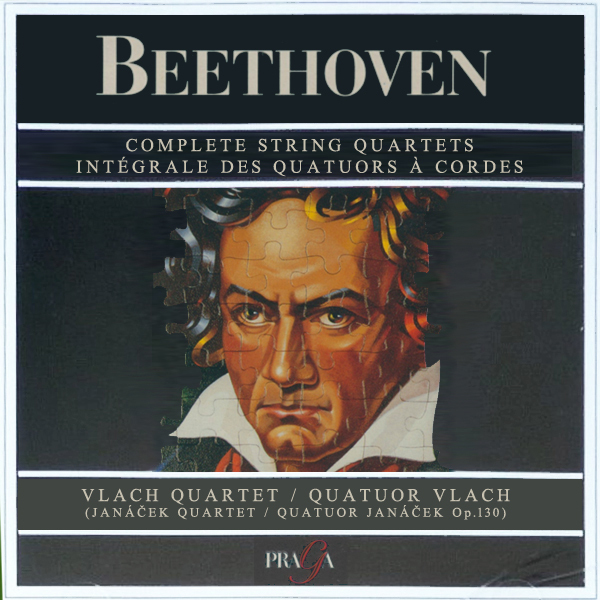 The pieces not usually included but included in this set are: op.18/1 in its first version. 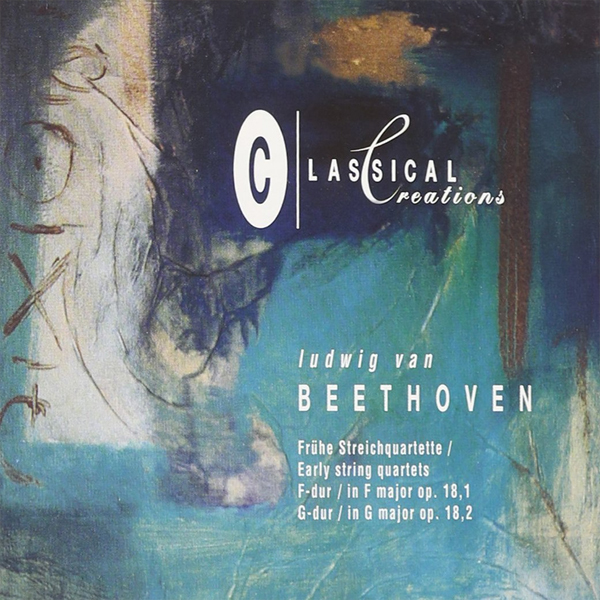 Allegretto in B minor, Prelude & Fugues H30 & H31, Minuet H33, Prelude fragment in D minor, the op.14/1 adaptation, the two String Quintets opp.4 & 29, Prelude & Fugue for Quintet fragment H40, Fugue for string quintet op.137. 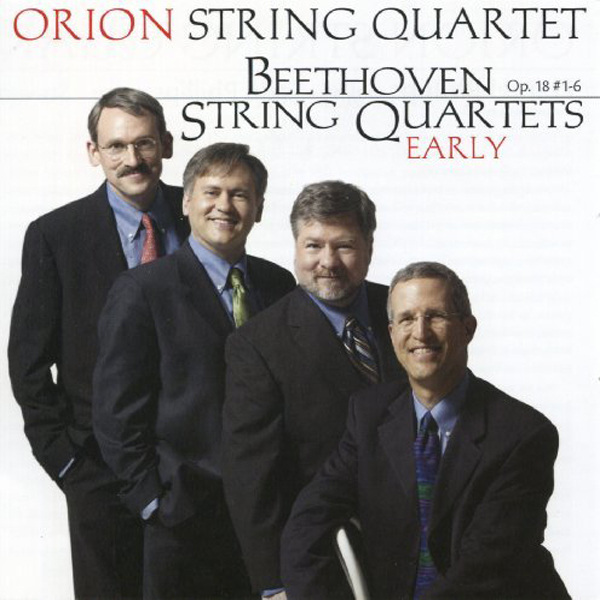 The Orion Quartet is in its 30th year. 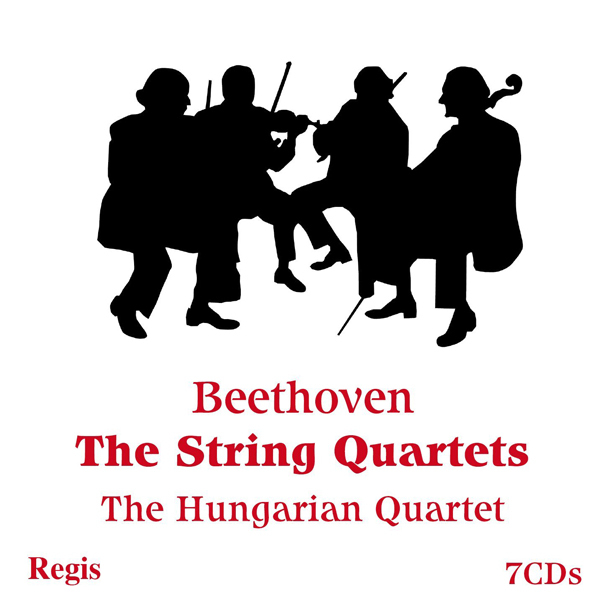 The Quartet is active commissioning quartets from composers which incl. 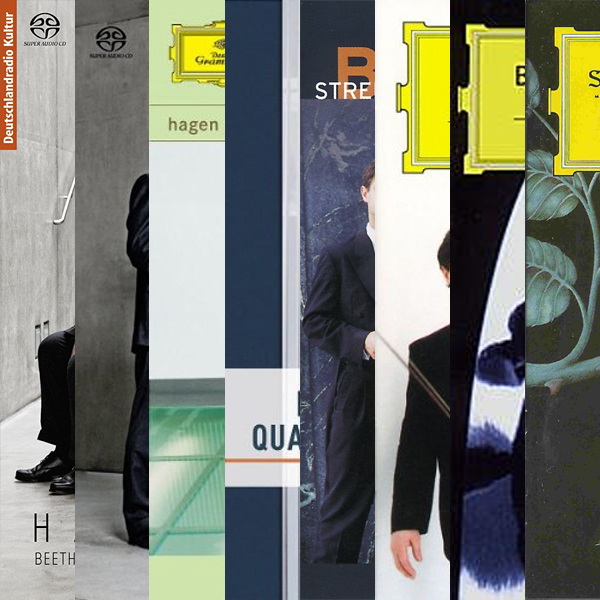 Chick Corea, Brett Dean, David Del Tredici, Alexander Goehr, Thierry Lancino, John Harbison, Leon Kirchner, Marc Neikrug, Lowell Liebermann, Peter Lieberson and Wynton Marsalis. Here is the Wihan Quartet's second contribution to LvB@4. 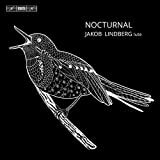 This time the recordings are live, brought out by Nimbus Alliance, the sublabel of Nimbus for recordings that are not their own. They have a base in London, where they perform regularly. 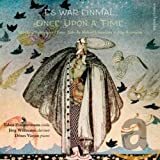 Reviews have been tepid, such as Andrew Clements' in the Guardian or those from MusicWeb Intl: Early Quartets and Middle Quartets / Brian Wilson (who is being nice about it), and Late Quartets / Patrick Waller. 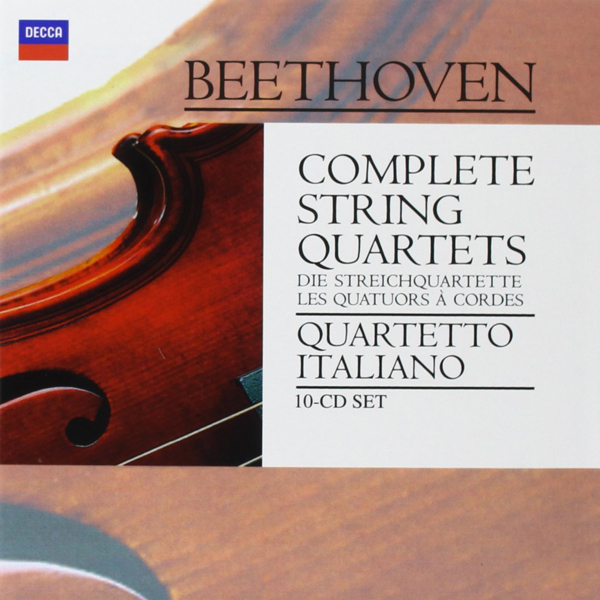 The cycle includes the string quartet version of op.14/1 (on the disc with the Middle quartets). Long before the Corcoran Gallery closed, it folded up its instrument collection. A superb Steinway B (?) 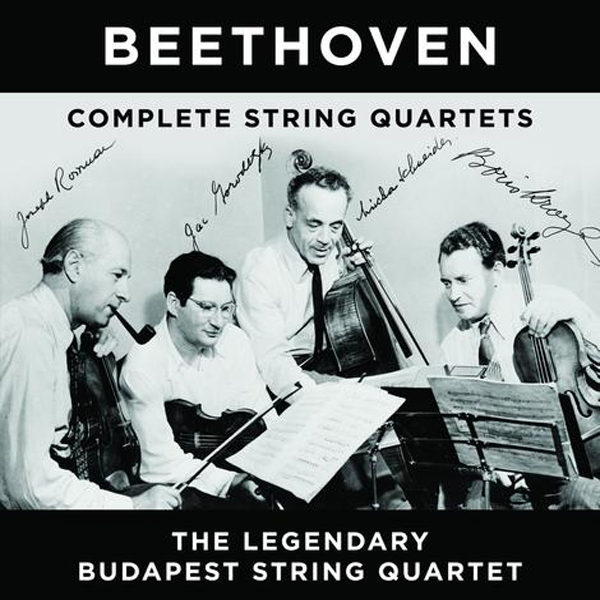 went, as did the "Paganini" collection of Stradivarius instruments, a string quartet set matching the only other such set across the Mall, at the Library of Congress. 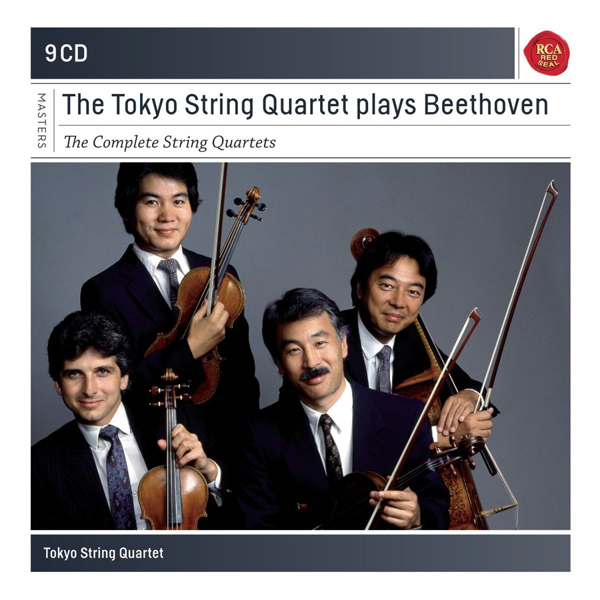 They were sold to the Nippon Foundation, which specializes in collecting and loaning Stradivarius instruments, who then handed them to the Tokyo String Quartet. 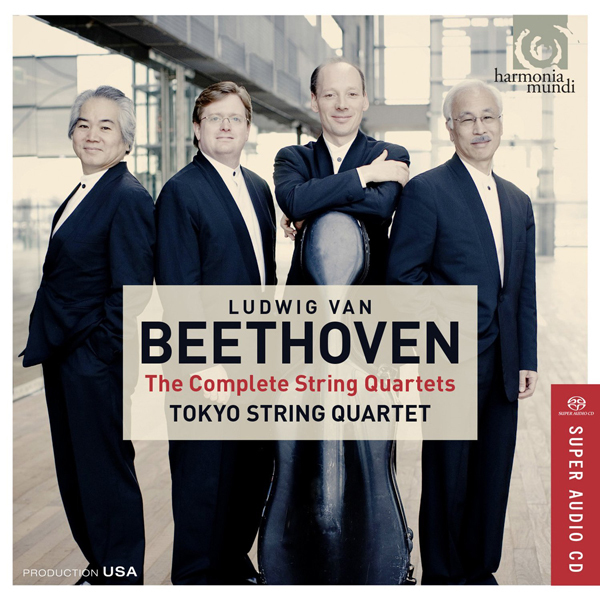 That breathed a bit of new life into the last years of the quartet and they recorded the Beethoven string quartets one more time, for Harmonia Mundi, on SACDs... and this time with Martin Beaver on first violin, having replaced Mikhail Kopelman in 2006. 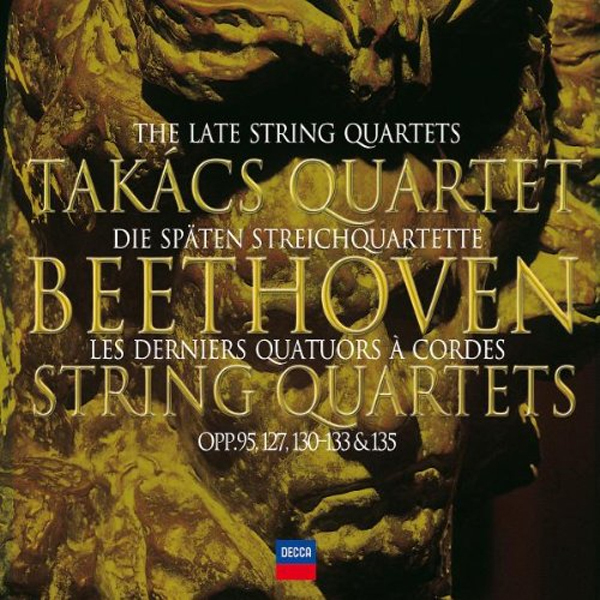 The early quartets given in very sophisticated readings, but the late ones - as so often - are not as clean and clearly deliniated as I should like them to be. For a while I thought that these had been live recordings, because of that... but they aren't. 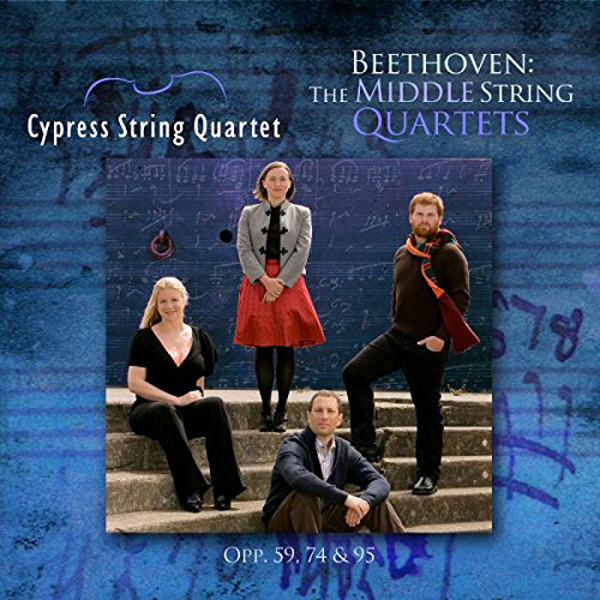 MusicWeb Review by Stephen Greenbank. 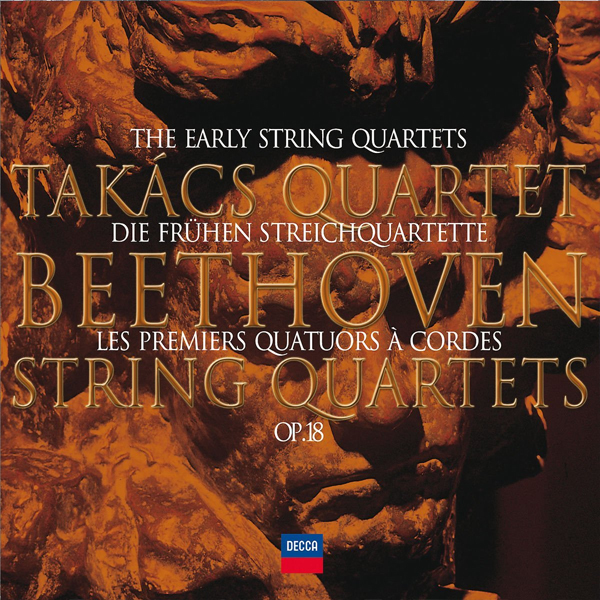 To me, this cycle rings in the age of the 'new' string quartet ensembles issuing cycles of their own, although the cut-off is probably mostly in my mind and the transition in fact more gradual. 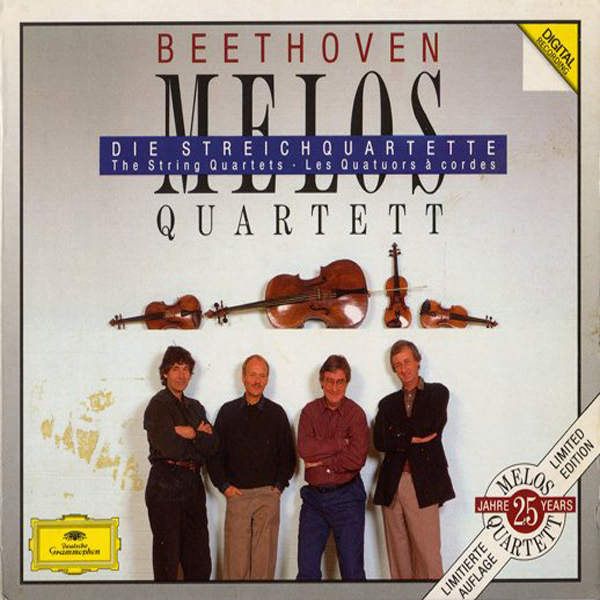 Still, the Artemis Quartet (which tragically lost Friedemann Weigle - also the violist for most of the Petersen Quartet recordings - to depression in 2015; see John von Rhein's excellent article on how the quartet has moved on), students of the Alban Berg Quartet, represent that generation of string quartets that has dazzled chamber music recital goers over the last decade with a standard of excellence which they have pushed to an exalted level across the board; the kind of excellence that may have been only an occasional occurance some thirty, twenty years ago. 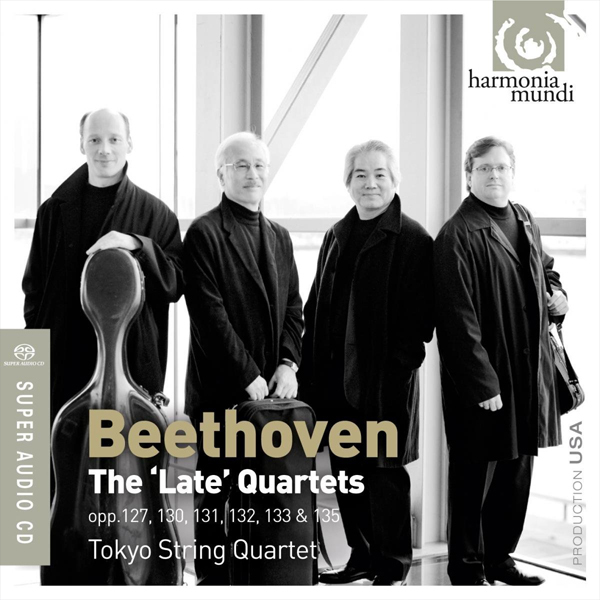 Not all of these quartets have yet handed in a recorded Beethoven cycle, of course (the Jupiter String Quartet, Quatuor Ébène, the Jerusalem, Pacifica, Heath ("Heaves & Pomerray"), Acies, Afiara, Verus Quartets, the EnAccord String Quartet, the Quartet Berlin-Tokyo etc. et al. 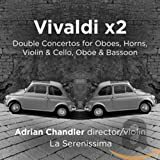 haven't, though some have played the complete cycle in concerts), nor is it necessary that they do, especially when there is so much more repertoire in such greater need of excellent recordings. 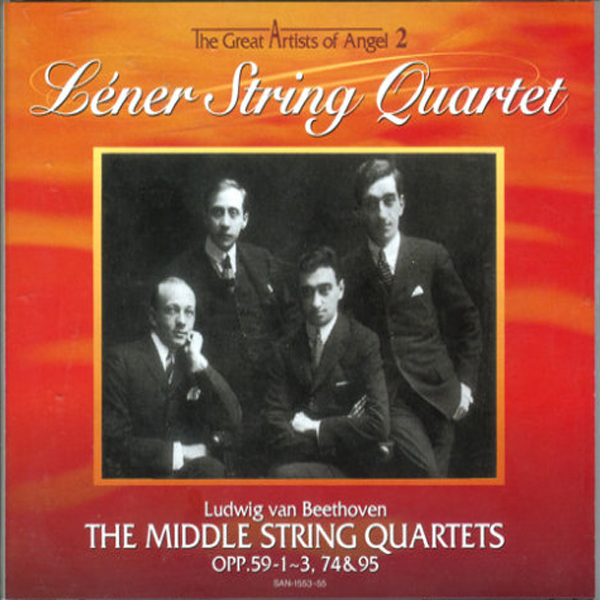 But those that have appeared are all quite special and technically at a level that exceeds all but the most stellar exemplars of the previous 75 years since the Léner Quartet's cycle hit the market. 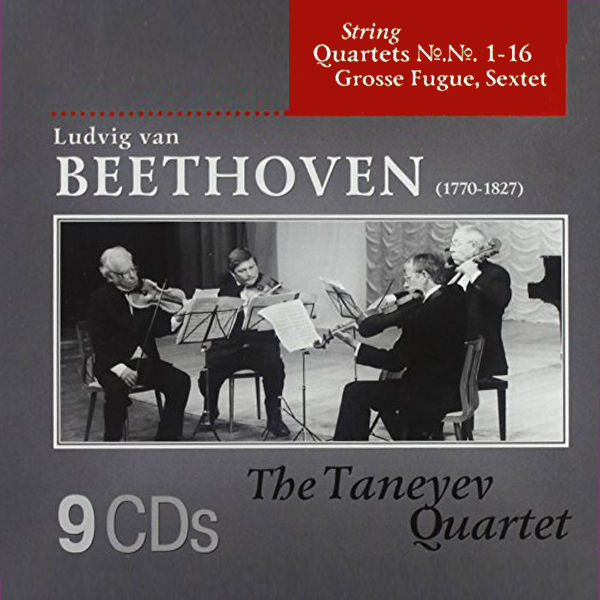 When this cycle was initially released on single discs, op.74 was never included, leaving early-adapters with the choice of skipping that quartet or adding the whole set to their extant collection... probably a planning mistake rather than deliberate (and short-sighted) strategy, but it made for some hard feelings and bitter thoughts among collectors. Canada's latest contribution. 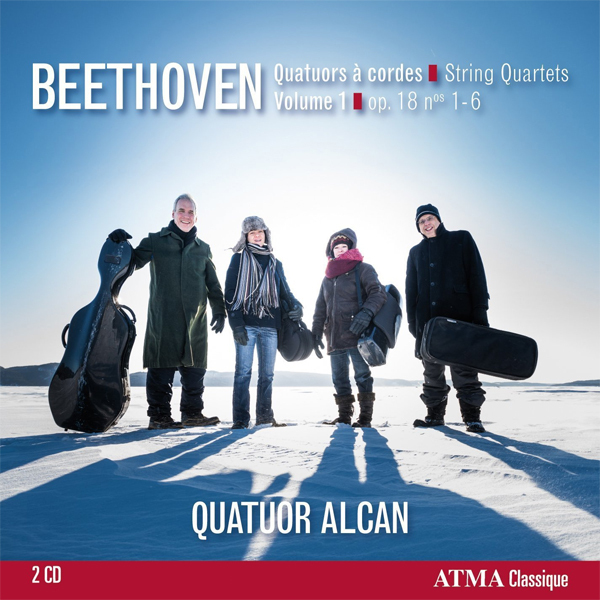 The quartet has since been re-named to "Quatuor Saguenay", presumably because the Canadian mining company and aluminium manufacturer Alacan eventually stopped funding the quartet, after having been folded into Rio Tinto of Australia. 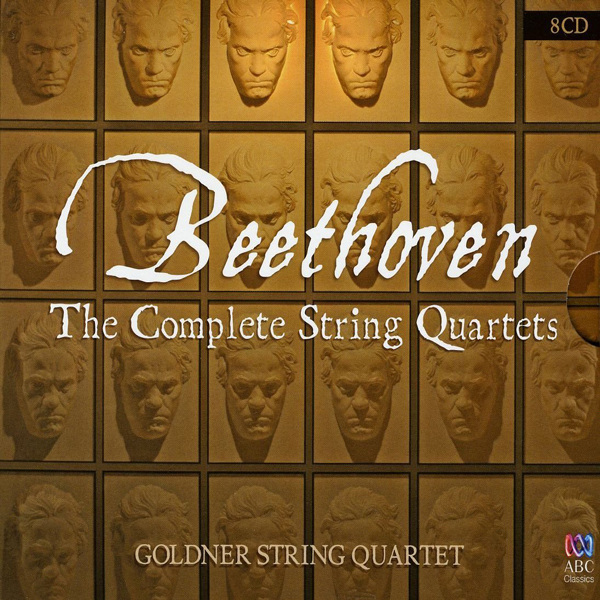 (Perhaps because the latter are rooting for the Goldner Quartet?). 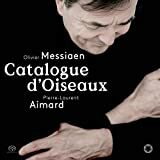 I am not very fond of what the Alcans/Saguenays do in op.127, but opp.132 and 135 are very fine. 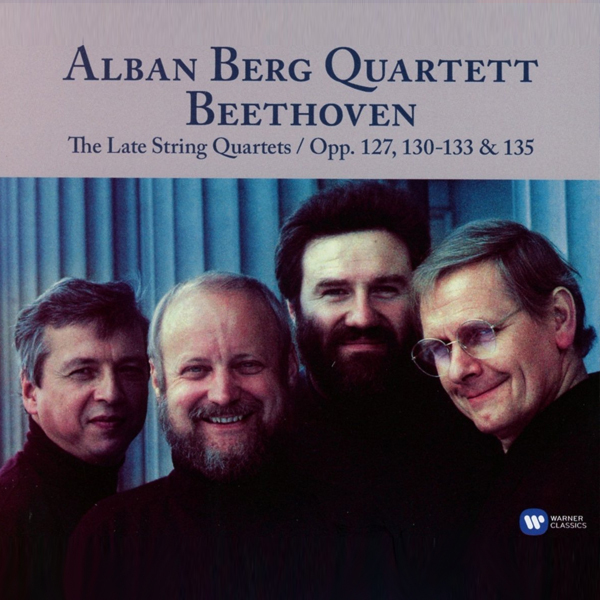 Another quartet (along w/the Artemis above) that studied with the Alban Berg Quartet - and they have since (along with the Artemis Quartet) taken on what used to be the ABQ's string quartet subsription cycle at Vienna's Konzerthaus. Also like the ABQ, they, too, had a live cycle from the Konzerthaus recorded... from about the same time as the studio set but not the same recordings. The detail and technical proficiency displayed in this cycle are superb. The cycle was first released on Zig Zag, then shortly thereafter re-released when Zig Zag was folded into Alpha, the new primary sub-label of Outhere music. 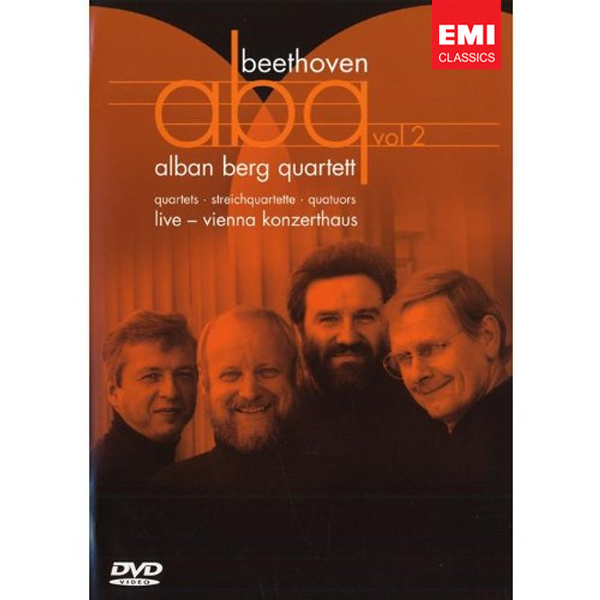 The Belcea's live LvB SQ4t cycle from the Vienna Konzerthaus on DVD/Blu-ray - which is not the same as the studio cycle on Zig-Zag/Alpha (see above). OOP already, it appears. 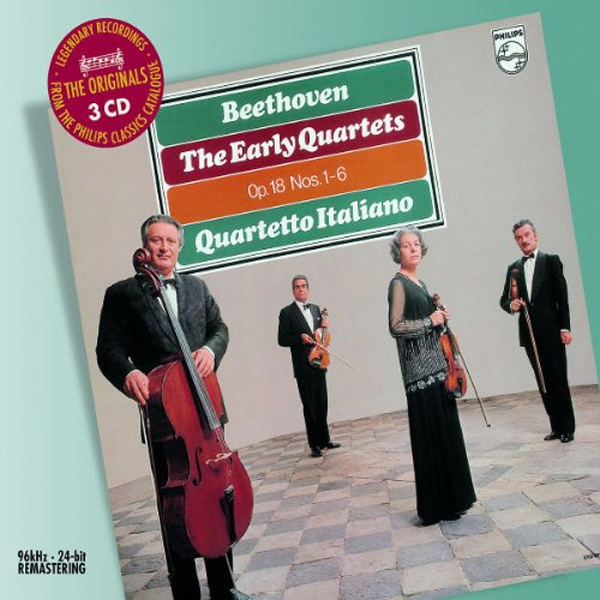 Had the record market continued to function in the oughts even remotely as well as it had in the decades before, the Hagen Quartett should by all rights have completed their Beethoven Cycle on DG. 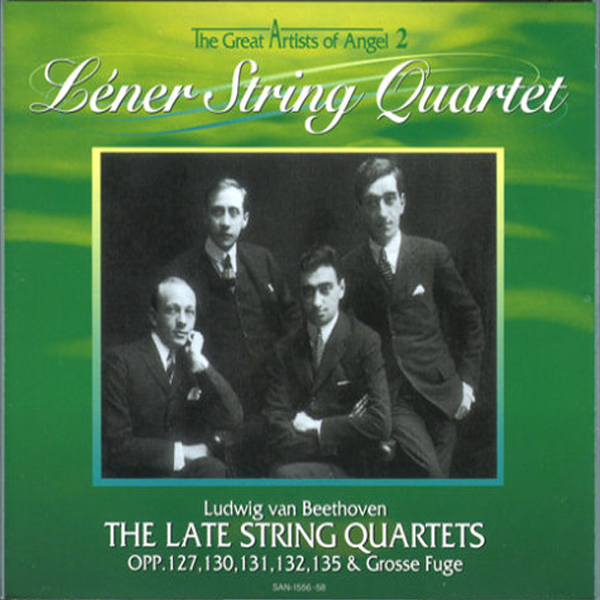 As it was, the label lost interest and the Hagen Quartet's association with the Yellow Lable ceased seven quartets short of the full 17 (= including the Grosse Fuge). 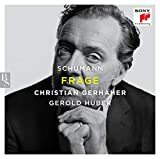 In truth, the Hagen Quartet's once fabled über-precision, started to decline, too, with first violinist Lukas Hagen—although most admirably a perfectly equal member without primarius-illusions of grandeur—experiencing a decline in accuracy and poise. 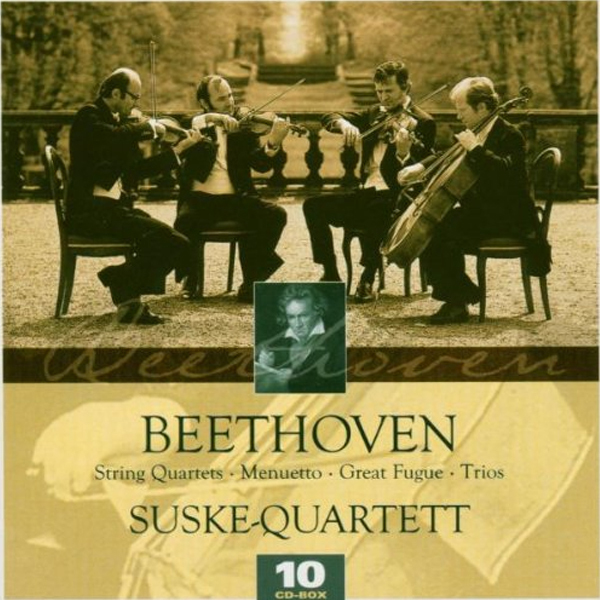 Still, it would be great to see a complete cycle from this quartet and it may possibly happen. 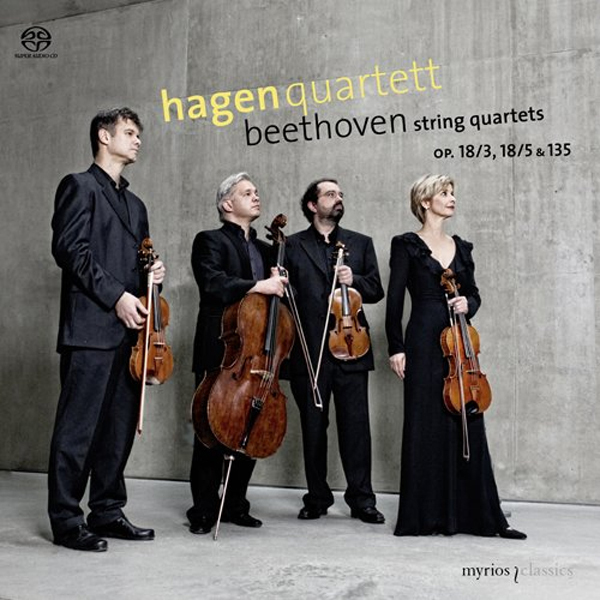 The young Myrios label picked up where DG left off, and betweent he two labels (a bit like with the Petersen Quartet), the Hagens are now only four quartets (Nos. 2, 6, 9, 10) short of the complete traversal. 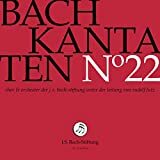 I particularly admire their recording of opp.127/132: "It is light, modern, clean. It reminds me of minimalist architecture--lots of glass, brushed aluminum, clean and bright wood." 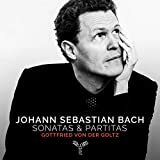 They have recorded op.133 and op.135 twice, the latter once here, stand-alone next to Schubert's Death & the Maiden and again as the finale of op.130. 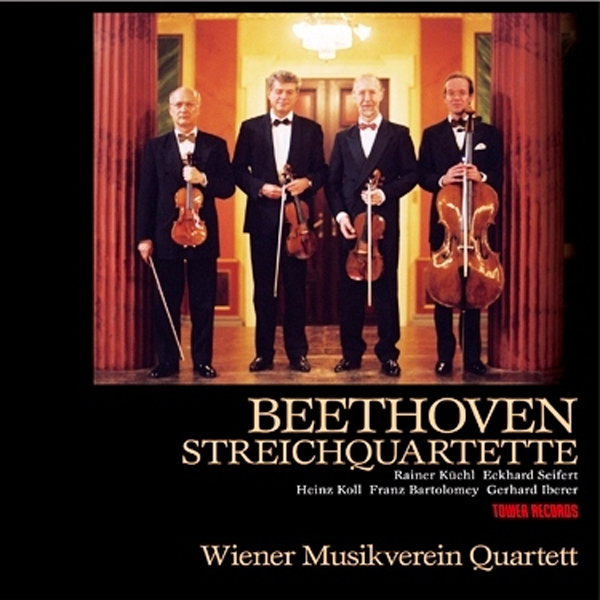 The Philharmonia Quartet Berlin is a bit to the Berlin Philharmonic what the Küchel/Musikverein Quartett is to the Vienna Phil. 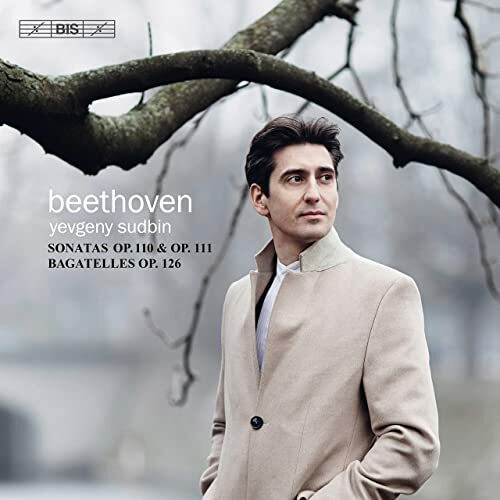 It seems they have recorded their Beethoven cycle in secret, but then that's what happens if you record on the marketing-challenged Thorofon label. (I'm constantly surprised the label even still exists, though I do enjoy several of the more obscure offerings they have brought out.) I would have never found out about it, if not for research for this discography. 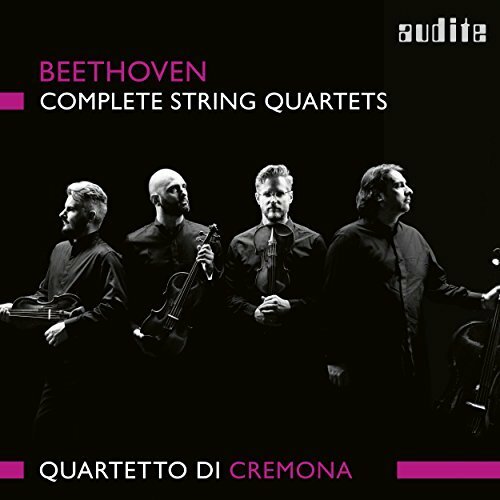 The third cycle to appear on SACD, the Quartetto di Cremona seems to do everything they can to be at the other interpretative spectrum from the Quartetto Italiano: These are radical, smashing readings, bristling with energy. A sense of rawness is pervasive... and it almost sounds historically informed-informed (that is: not the thing itself, but aware of it), but then executed with modern helter-skelter means. 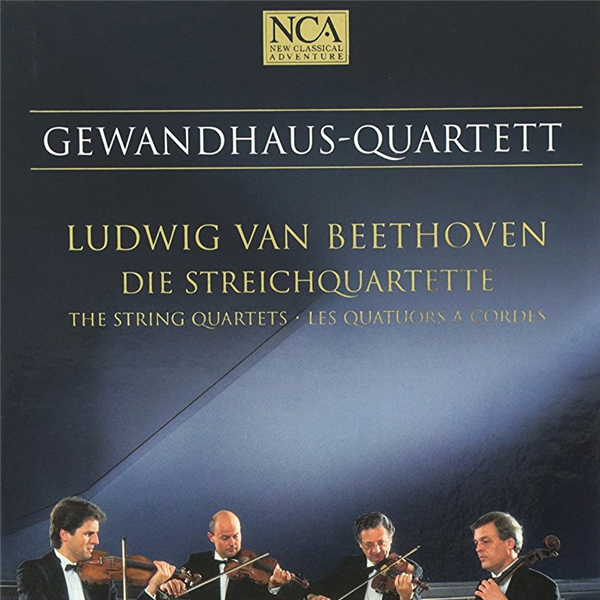 They also play Lachenmann and early Haydn, apparently. 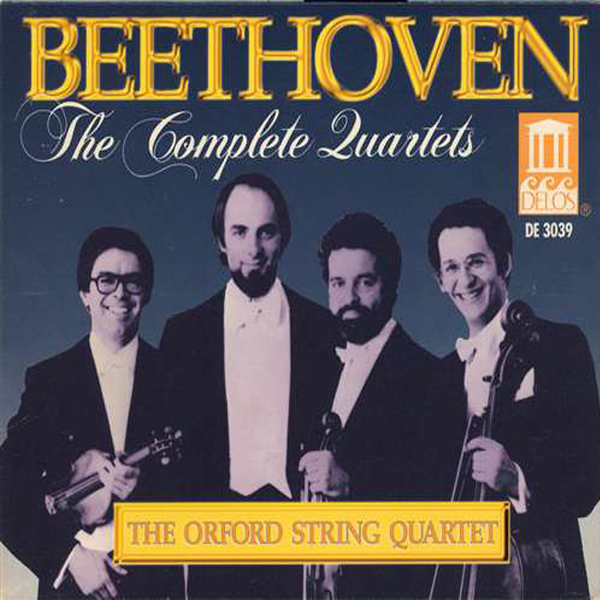 Hearing their Beethoven, I readily believe that. This set will probably be boxed eventually, but for now it is out in eight individual releases. 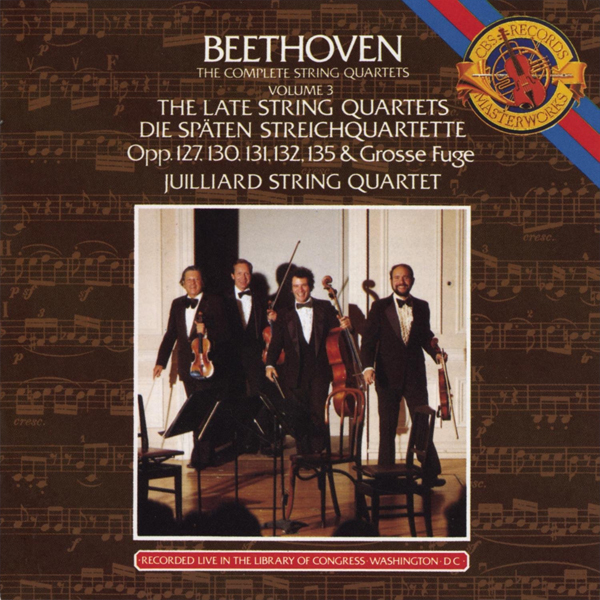 Includes the String Quintets. 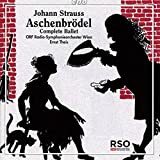 Edit: The box, retaining the SACD format (unlike so often, where the box set of some release-series will include only the Red-Book CD versions) will be released in June of 2018. 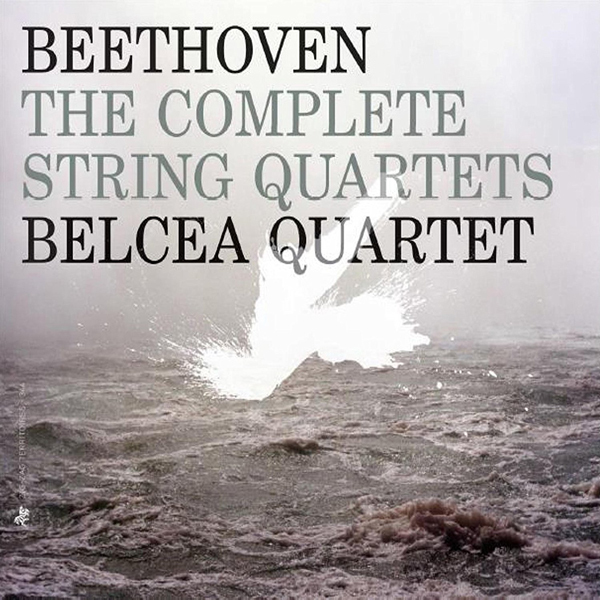 Not yet completed but among the next to be concluded... perhaps alongside the cycle of the Arianna String Quartet. This is an excellent survey. Thank you so much for taking the time to research and write it. 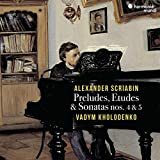 You might be interested to know that most of these sets are available on Spotify. I now have several new sets to check out! Thanks for the kind words. 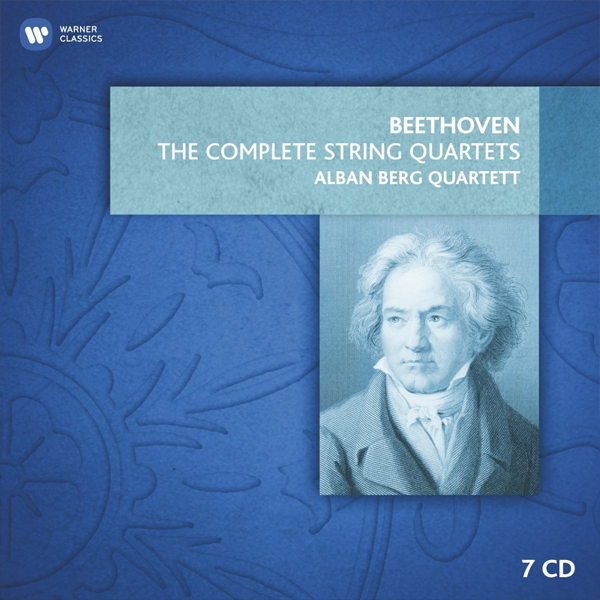 I reckon that a lot is available at Spotify; even more at the Naxos Music Library. I thought of making a spotify playlist but then thought better of it, since it would be very difficult to navigate and not very practical. 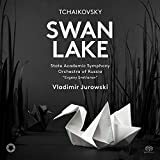 What might be better would be links to the sets on spotify, where available... but that is yet again a lot more work which I would do, or so it'd feel, only because Spotify is too lazy to properly meta-tag classical music. 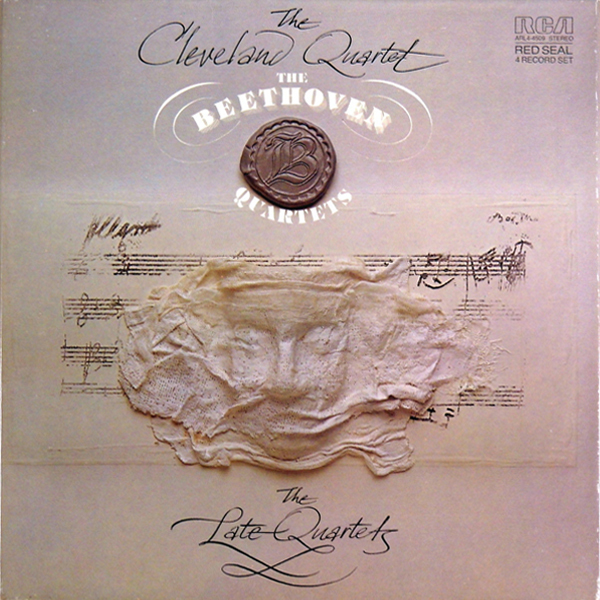 Thanks for this wonderful survey--I didn't see the first Cleveland Quartet Cycle, which to my knowledge only appeared on RCA LP sets in the late 70s/early 80s. If you need it, I can provide the box numbers. I also transferred the LPs since I'm not a subscriber to any streaming service, so I don't know if they're at all available in digital format. Thanks, Bill, for the comment. 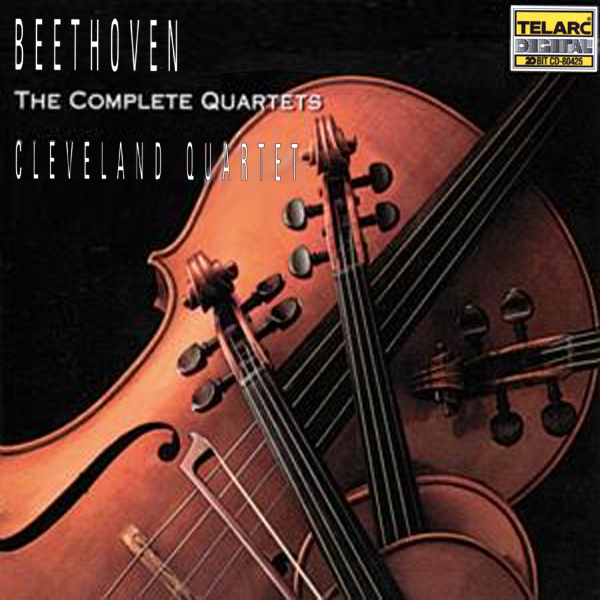 There IS an early Cleveland Quartet Cycle??? Yes, I would love to know more about it. 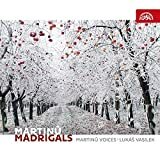 Do you happen to have the recording dates (earliest and latest)? It never made it onto CD then, huh? 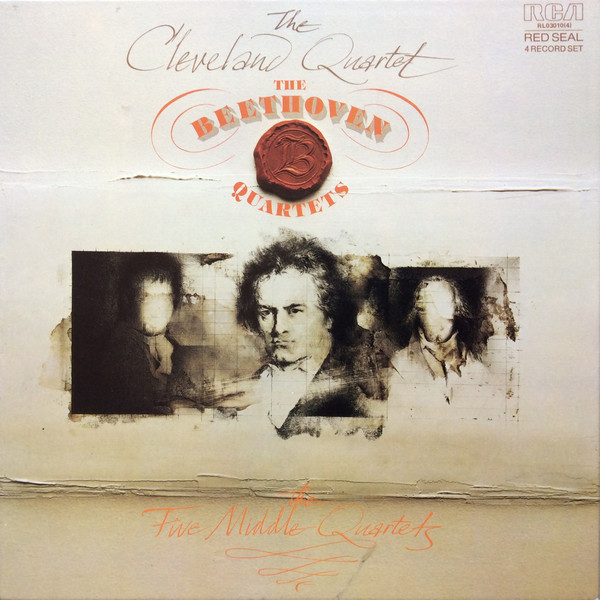 jfl--I don't know the exact recording dates of the earlier Cleveland cycle, but the LP sets were first released in 1979, 1980 and 1983. 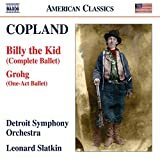 And no, it appears that the first cycle was never re-released on CD. 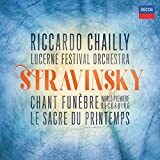 I'm willing to share Google Docs links for my transfers of the first cycle, along with pretty much all of the RCA LPs that they did, which were also never apparently re-released on CD. 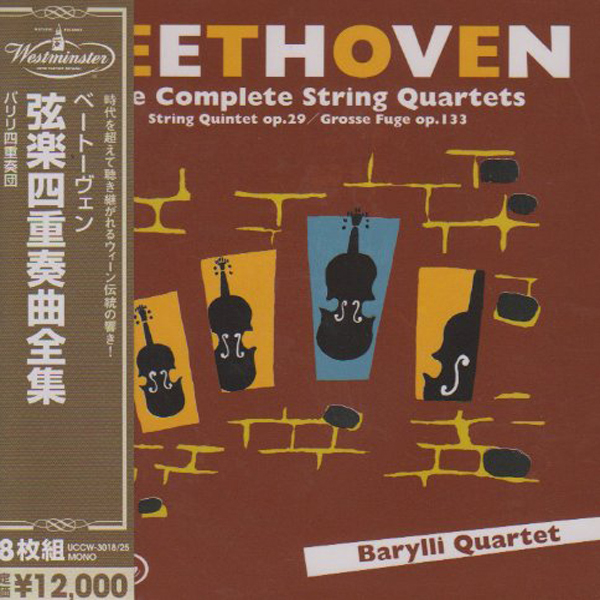 I did these because my son studied under Don Weilerstein at New England Conservatory, and Mr. W hadn't heard these old recordings for decades, so we gathered secondhand copies of the disks and did the transfers, which we gave to him. Hello again! 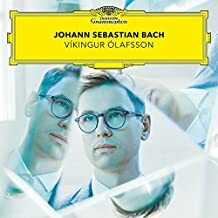 It looks like we have a new release of an old classic. 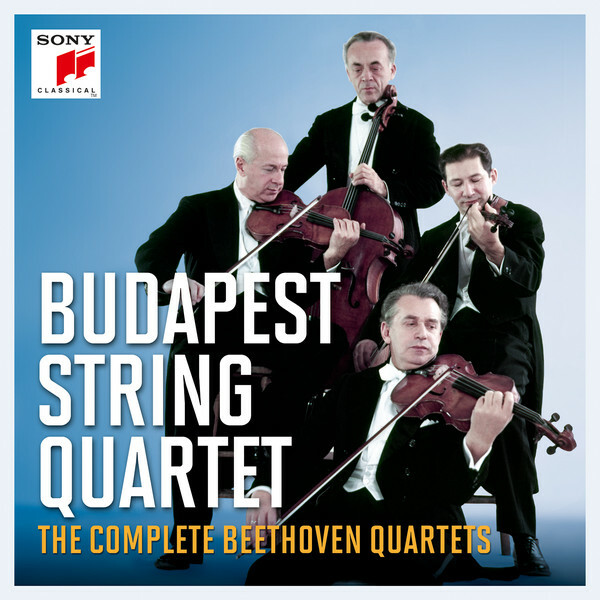 Unless I'm mistaken, Sony has just released the mono Budapest cycle mentioned above as Budapest 1. 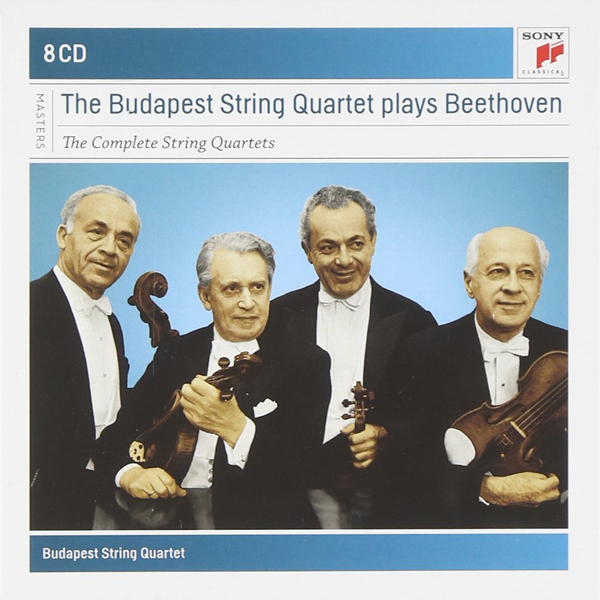 Here's the Amazon link: https://www.amazon.com/Budapest-String-Quartet-Complete-Beethoven/dp/B0776K6TTN/ref=sr_1_1?s=music&ie=UTF8&qid=1523589148&sr=1-1. 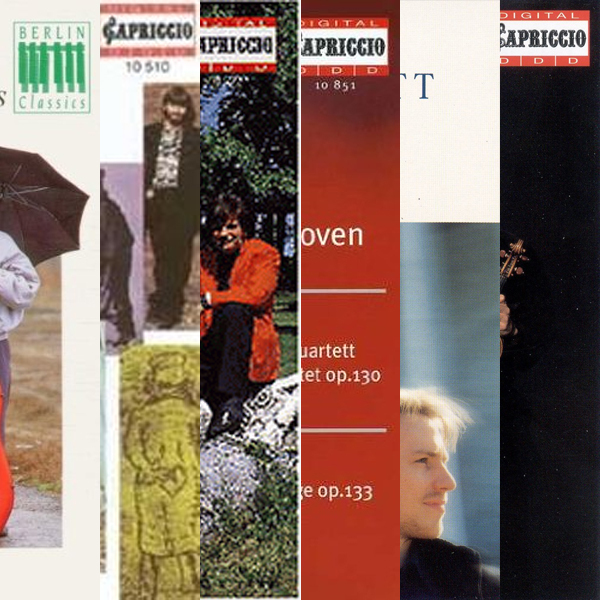 Great discography! Thanks so much! 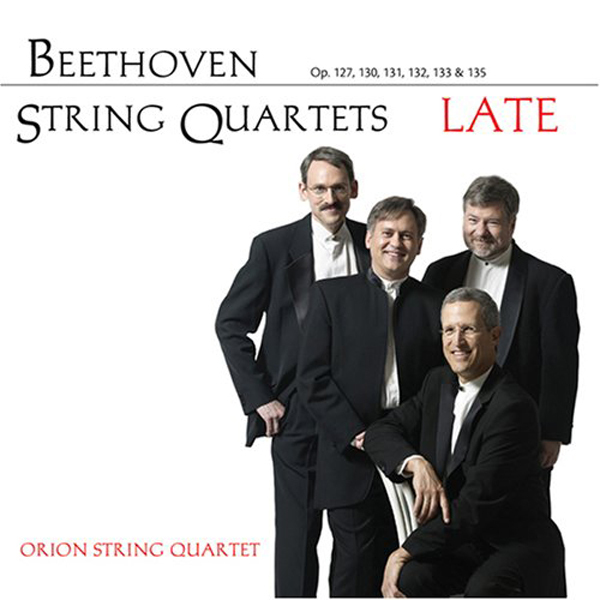 Have you considered including collections of only the late quartets? As you're no doubt aware, there are several notable, even legendary sets: the Busch, the Hollywood, and the Yale sets immediately come to mind. 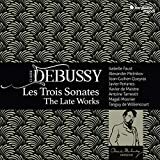 The LaSalle also recorded a set, and the Mosaïques recently released a provocative new set (although I don't think they have plans to complete a cycle by also recording the middle quartets ... but who knows?). 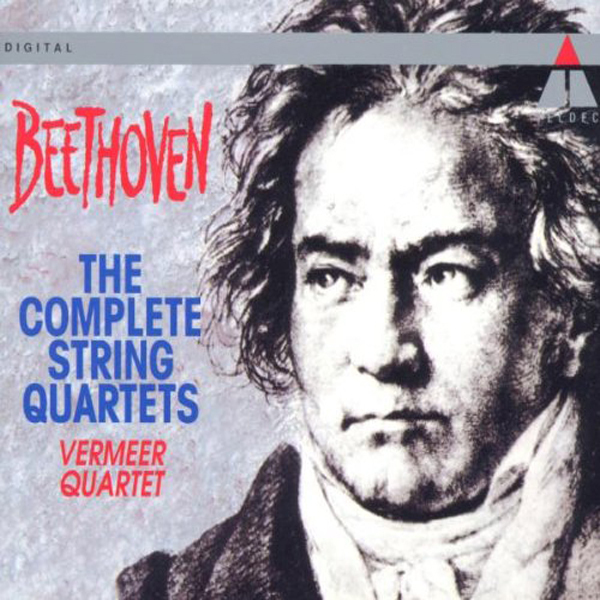 I can't imagine a Beethoven quartet aficionado going without at least some of those collections! Thanks for the comment - and apologies for seeing it only so late. 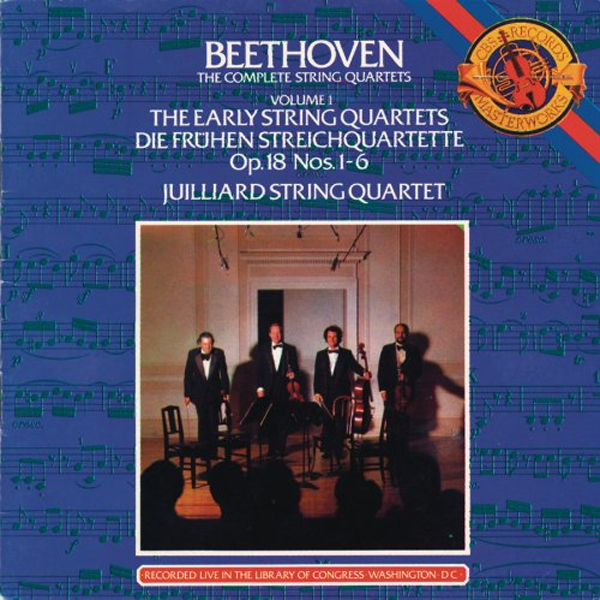 I have not thought of making an overview of just the late quartets... at least not so far. 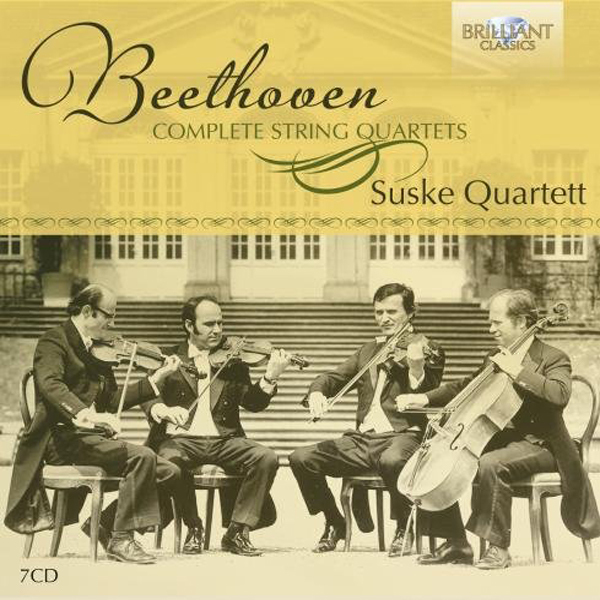 But come to think of it, the Busch Quartet should have a fairly decently sized Beethoven String Quartet discography, if one collected all their recordings. 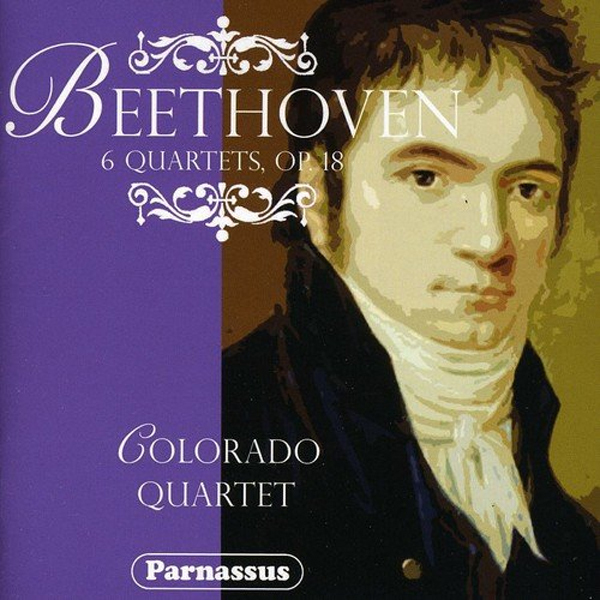 Perhaps a "notable/incomplete cycle" page might be merited, sort-of as with the Beethoven Piano Sonatas. 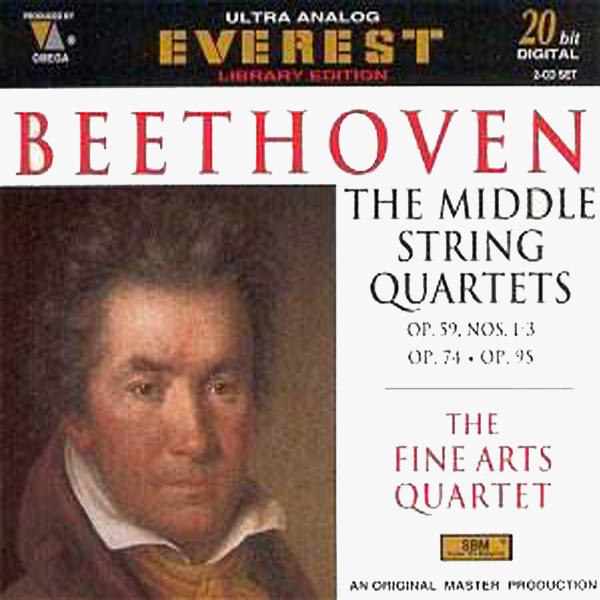 I think that they will at least try to record the middle quartets as well, actually. I briefly spoke to them about continuing the cycle on Naive on a different label (before Naive was taken over and resuscitated) and they appeared very willing. Greetings Jens! I wanted to alert you of one additional (and quite rare) existing complete set, along with three others that are nearing completion. 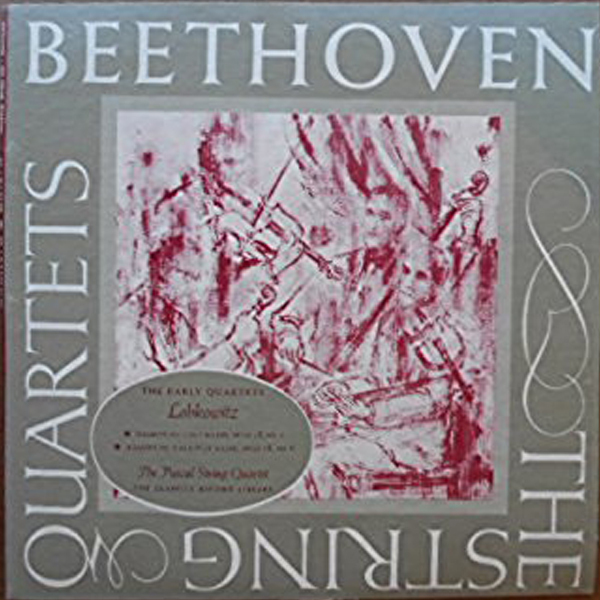 First, there was a "joint effort" complete set by the Aeolian Quartet (late quartets) and Gabrieli Quartet (early and middle quartets) on London back in the 90's. 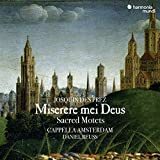 You can find a link to it on Amazon, although the MP3 version they link to is incorrect (it links to the earlier Hungarian set). This is actually a very good set, and rather hard to find. I lucked into it on eBay a few years back. 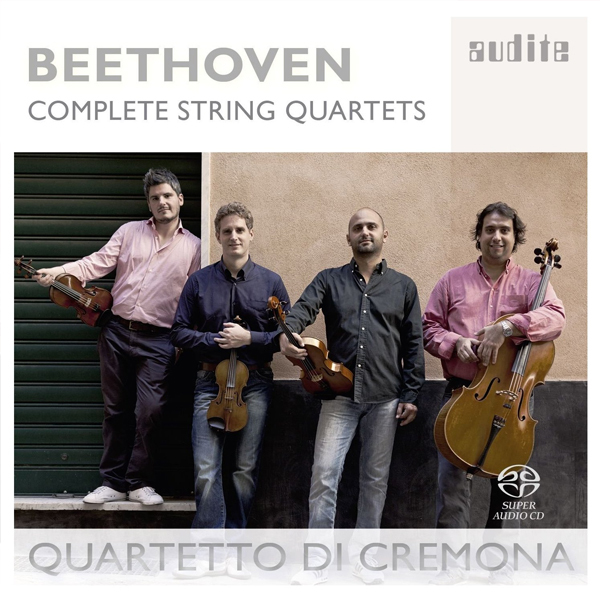 In addition, the Miro Quartet, Cuarteto Casals and Arianna Quartet are all nearing the completion of their sets. 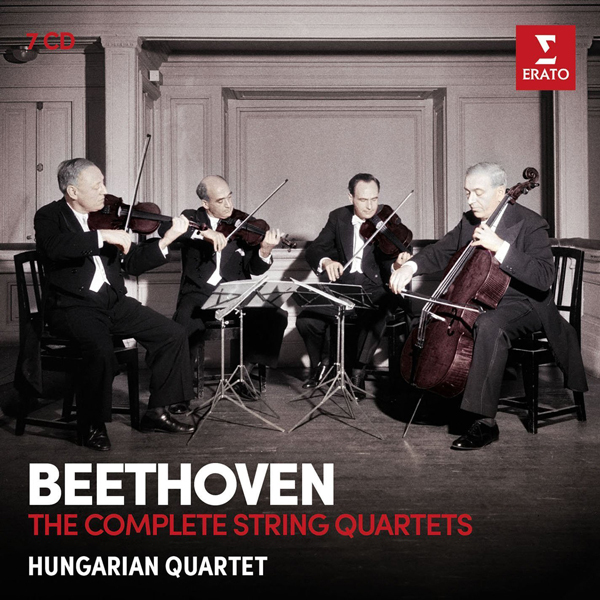 The Miro Quartet currently lack only Op. 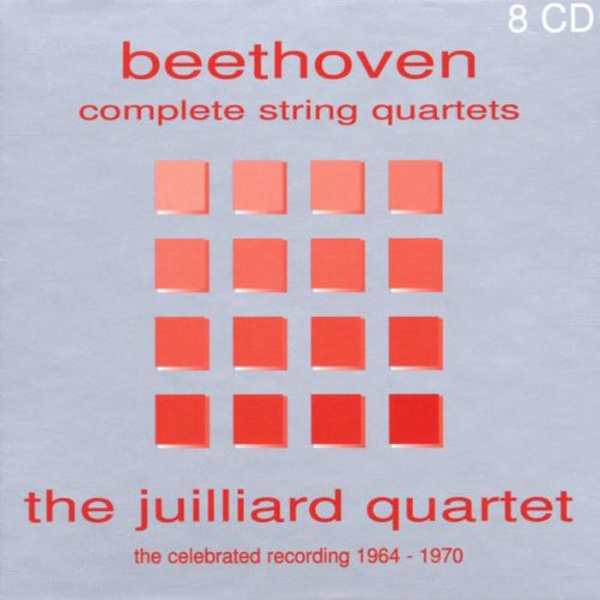 127, 132 & 135; the Casals are 2/3 of the way through; and the Arianna lack the Late Quartets. I must say for be the Berg remains the best. 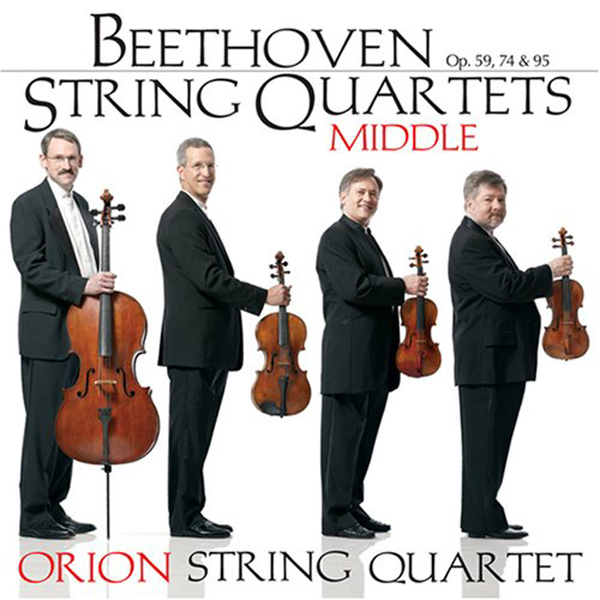 they are not too slow (Cleveland, Borodin) not too fast (Emerson). 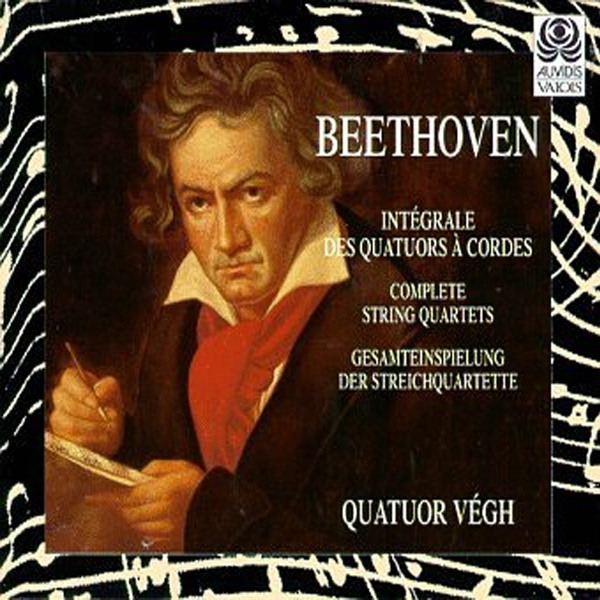 With gorgeous tone but also great vigor. But, let's face it, it's the music that is out of this world. 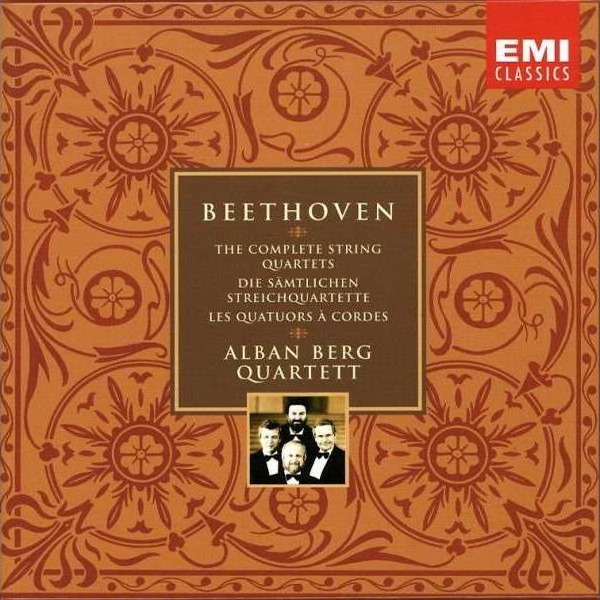 Thanks much, Mark, for the tip on the Gabrieli/Aeolian on Decca. I found some information on it, but not all. 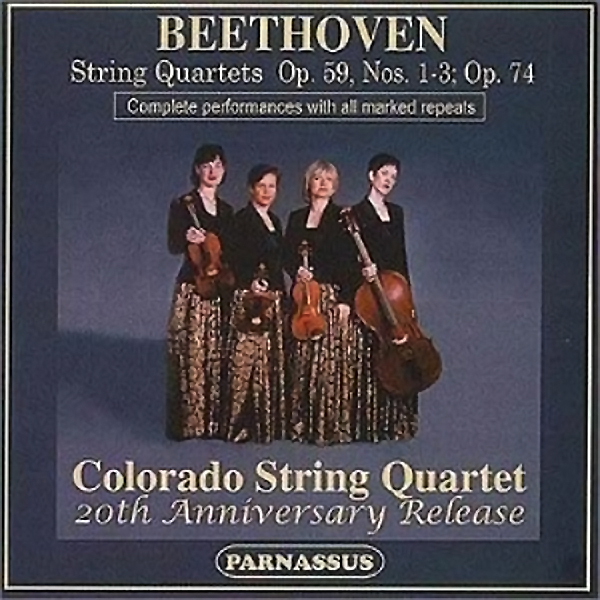 Any chance you could read in the liner notes when these were recorded? Between 1974 and 1979 would be my estimate, based on the little information I could find. But having been, for however brief a moment, "THE" standard Decca set, that's a major omission/find on my part. 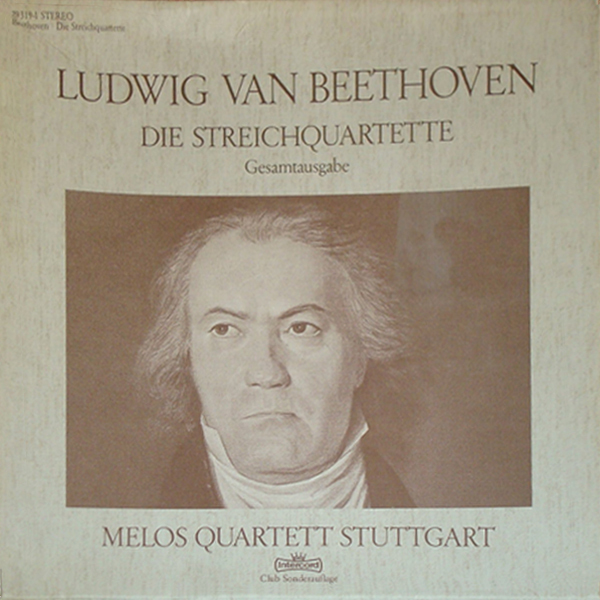 According to the liner notes, the recordings took place in 1974, 1978, 1979 and 1981. 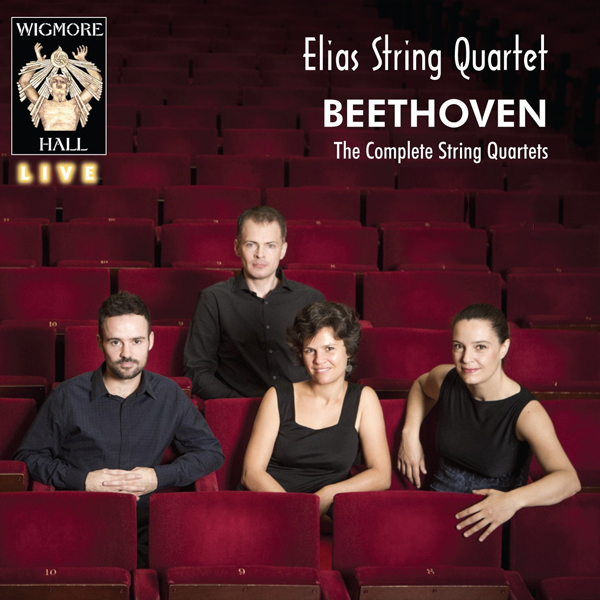 Venues were Kingsway Hall, London; St. John's, Smith Square, London; Rosslyn Hill Chapel, Hampstead; and St. Barnabas Church, London. For all that variety, the set is quite enjoyable and doesn't sound overly patchwork.